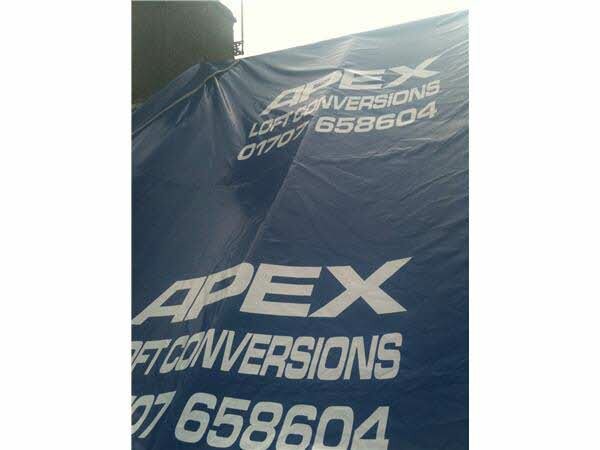 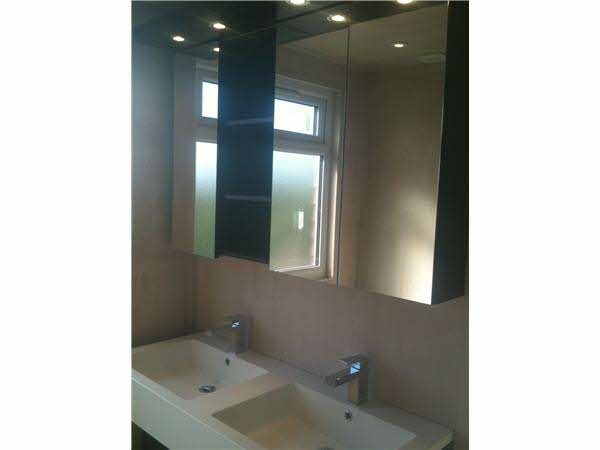 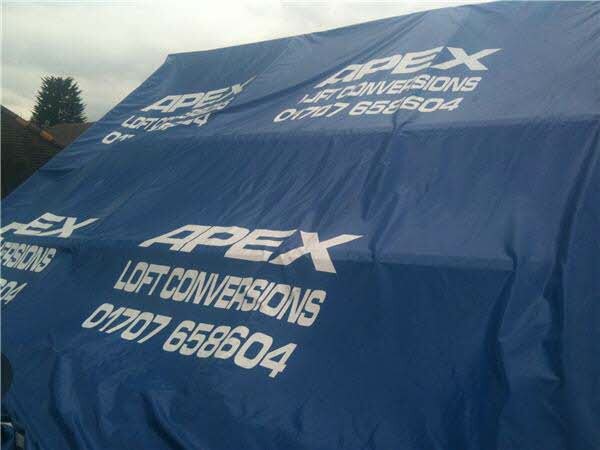 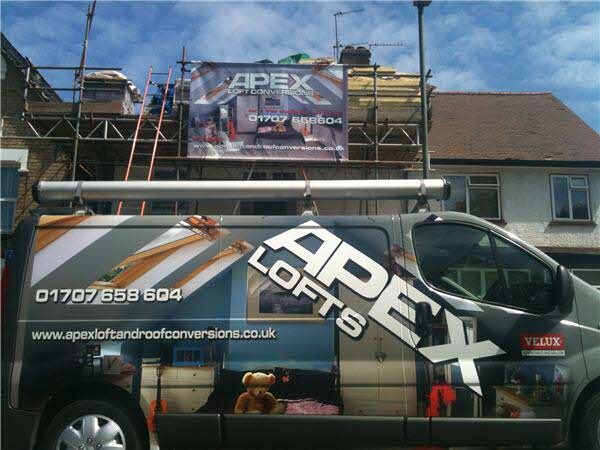 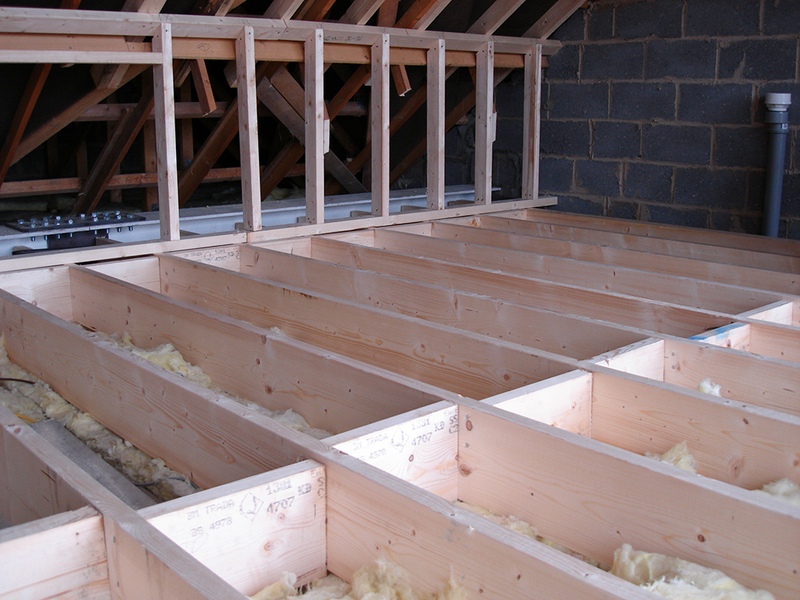 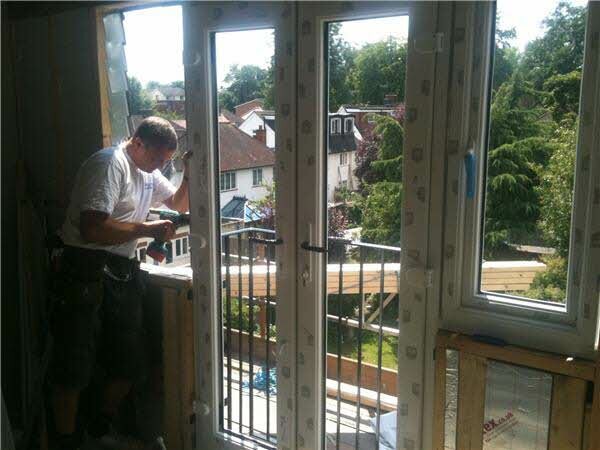 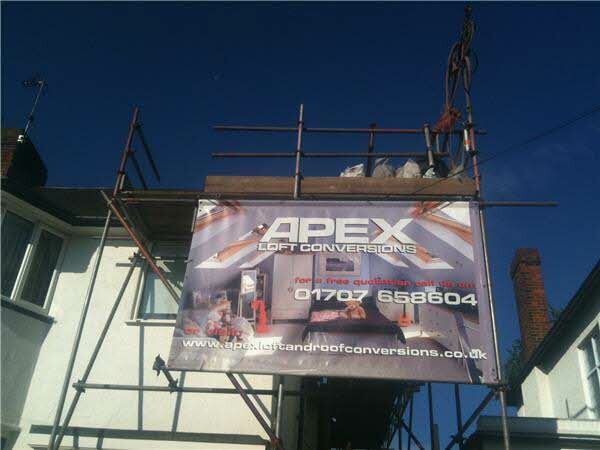 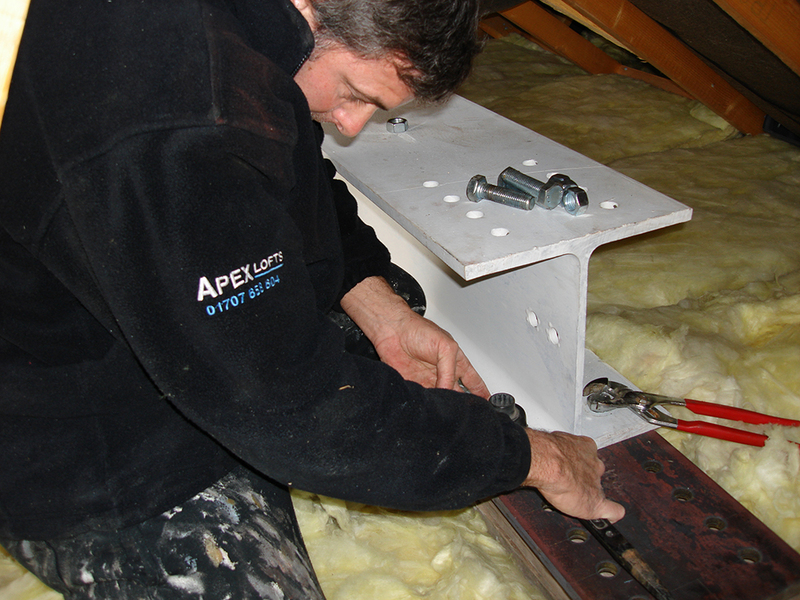 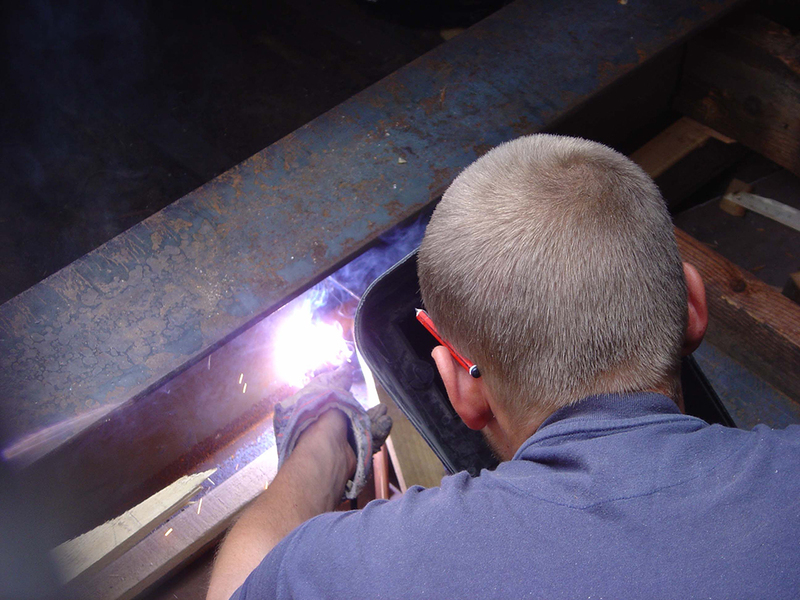 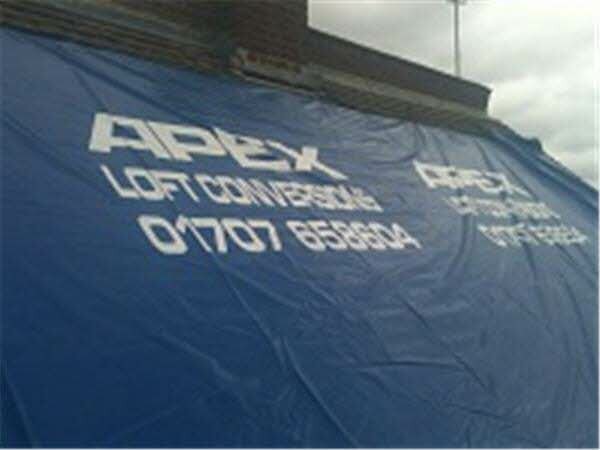 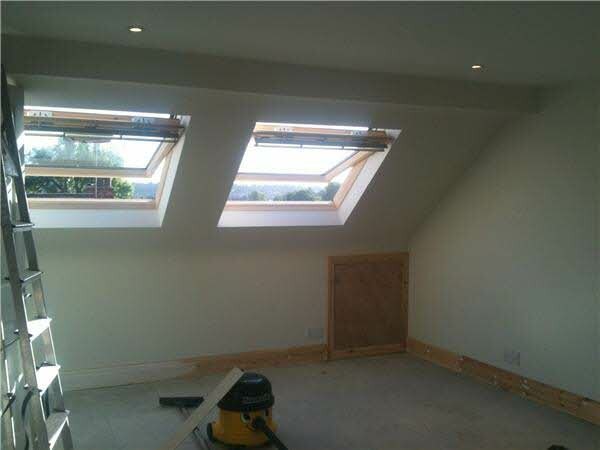 This part of the site allows you to follow the progress of a completed loft conversion from the moment we started work to the end, polished product. 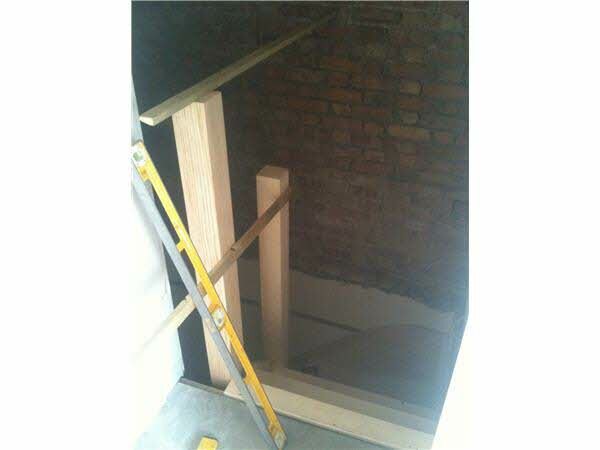 For further loft design ideas and even more insight into the life of a loft conversion, take a look at our latest work for up to date pictures of the loft conversion we’re working on right now, browse our portfolio of bedrooms, bathrooms and staircases, or for information on plans, quotes and what is included, please click here. 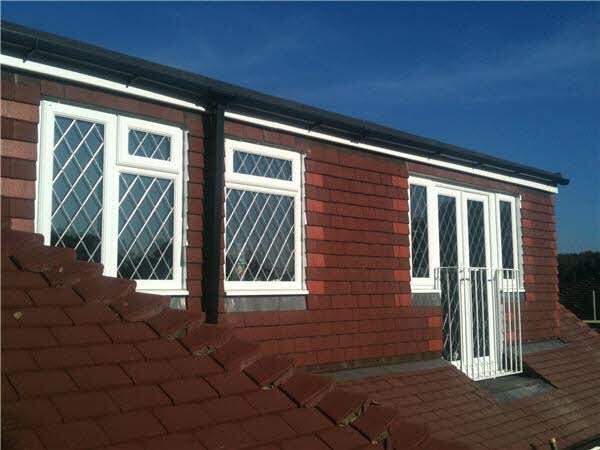 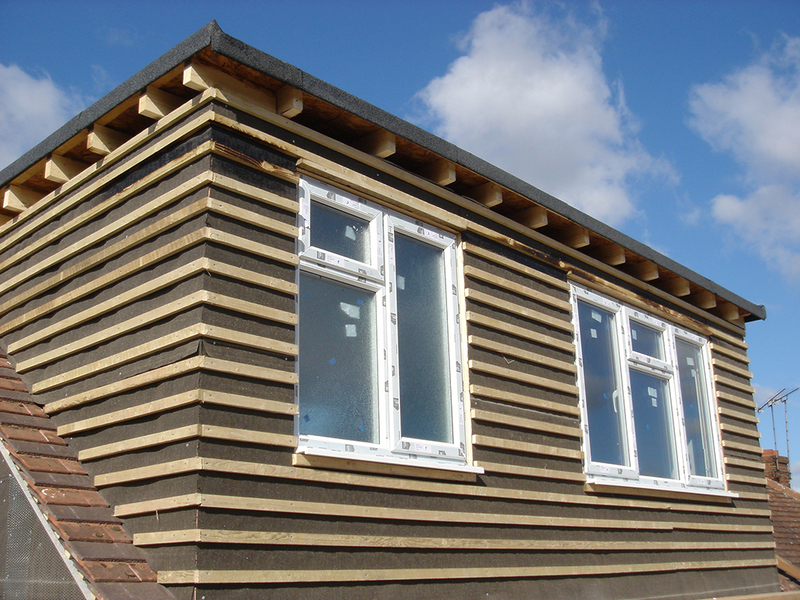 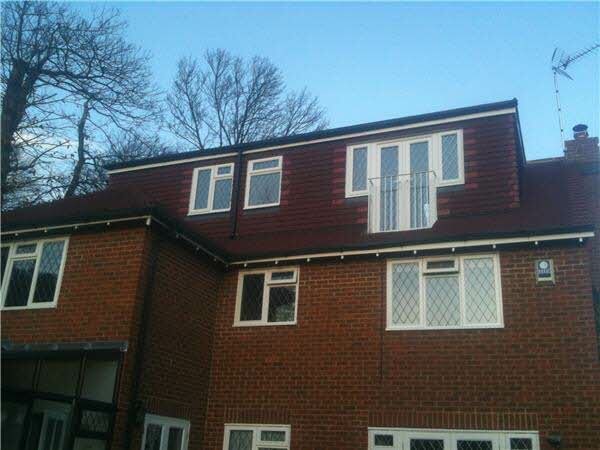 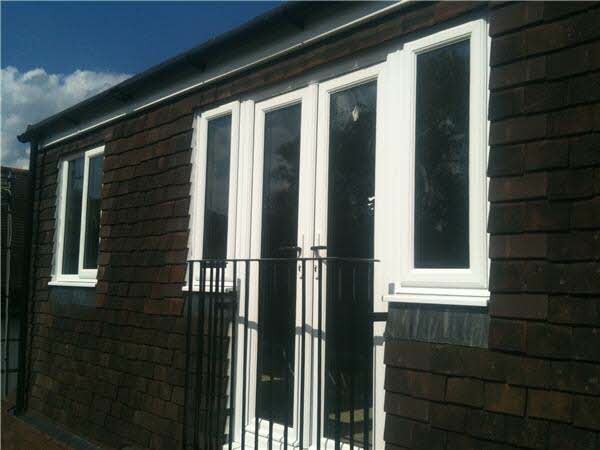 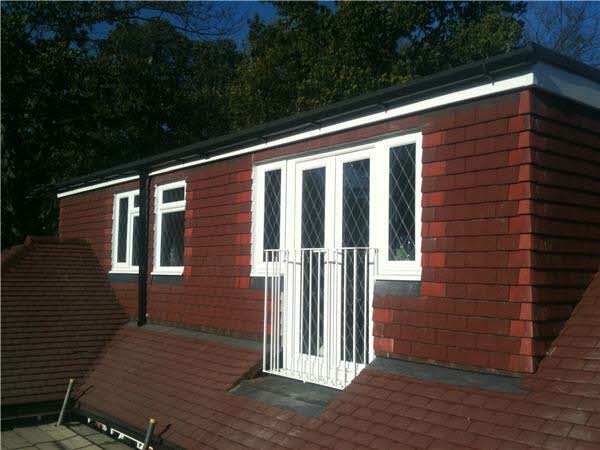 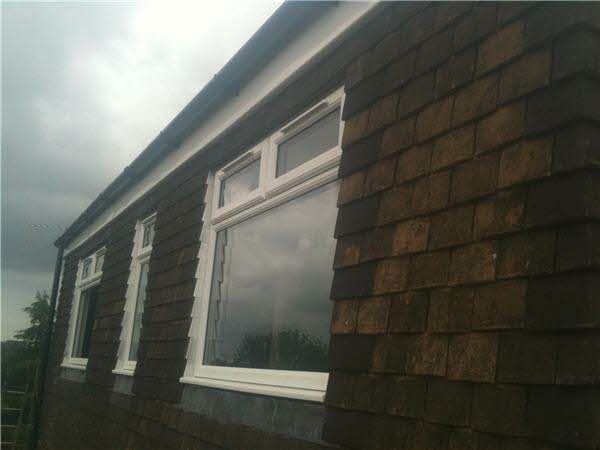 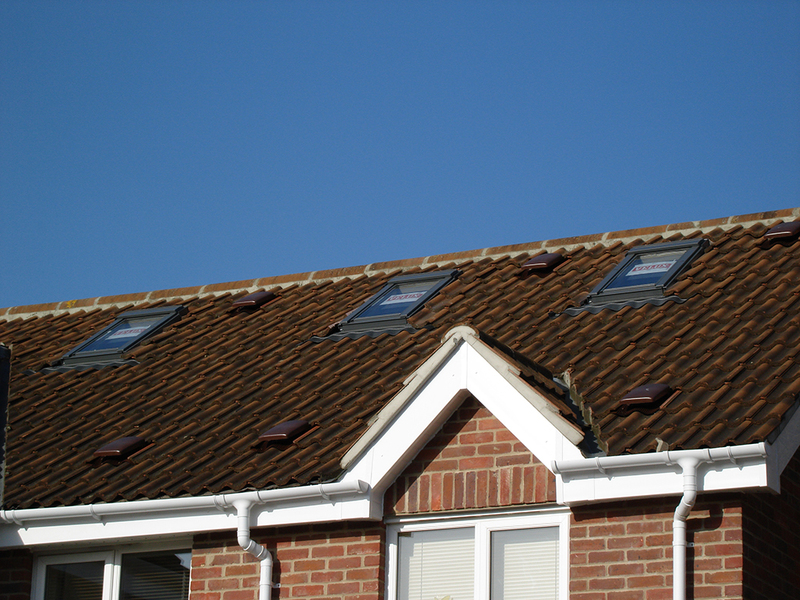 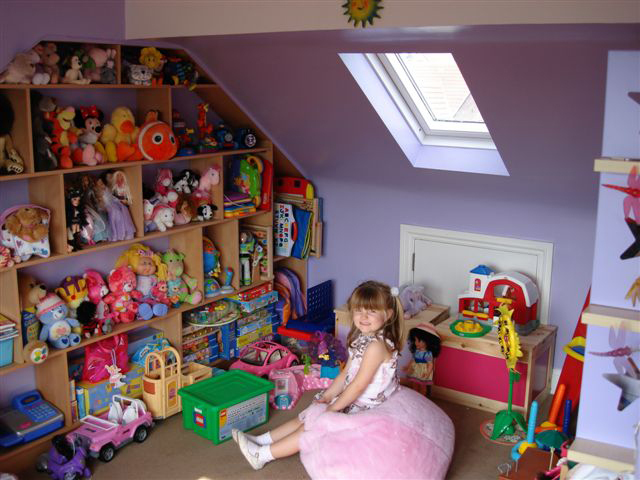 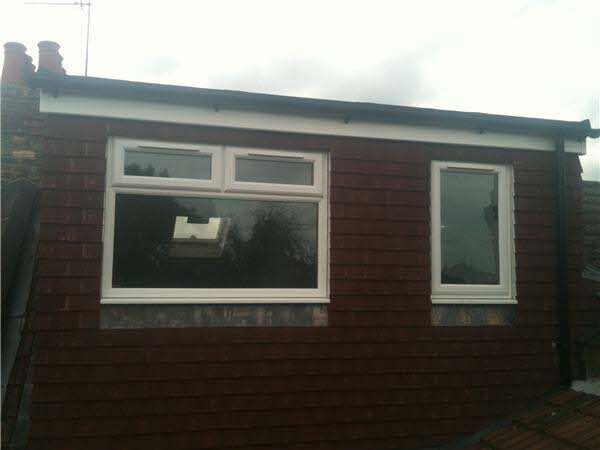 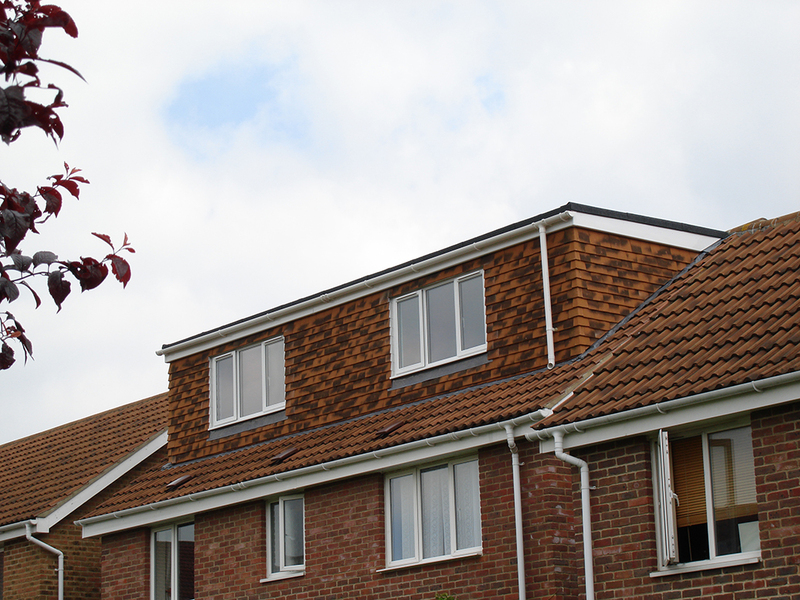 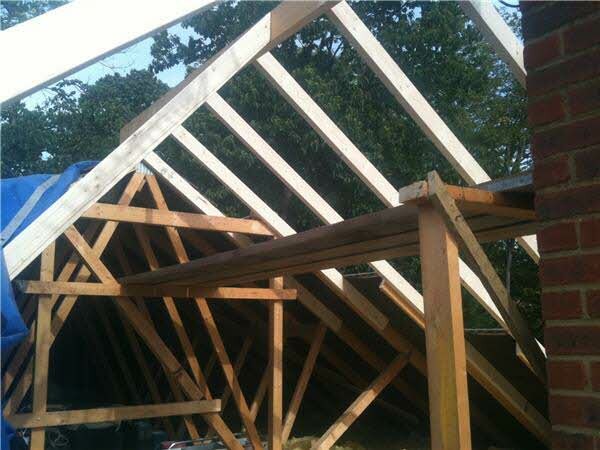 This is an example of Twin Gable Ends & Rear Dormer Loft Conversion we constructed in Oaklea Wood, Welwyn. 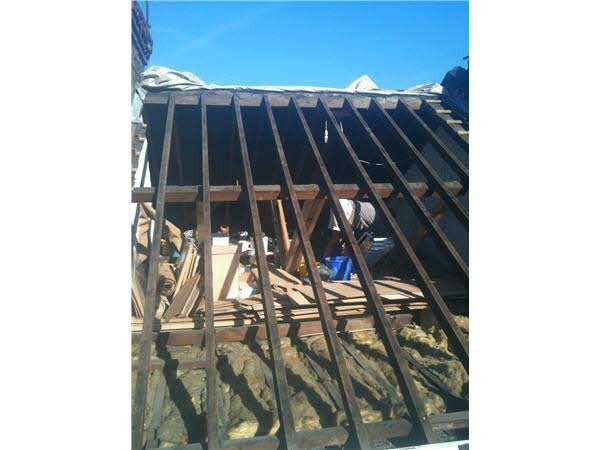 Once the main roof was made ready with scaffold erected, the gable ends were stripped and the flank end fully exposed to create the gable end. 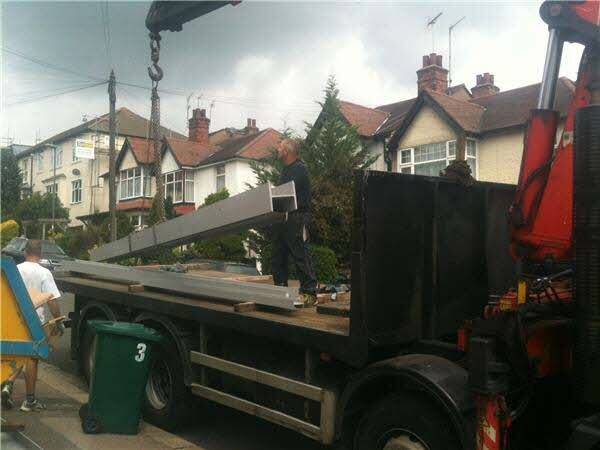 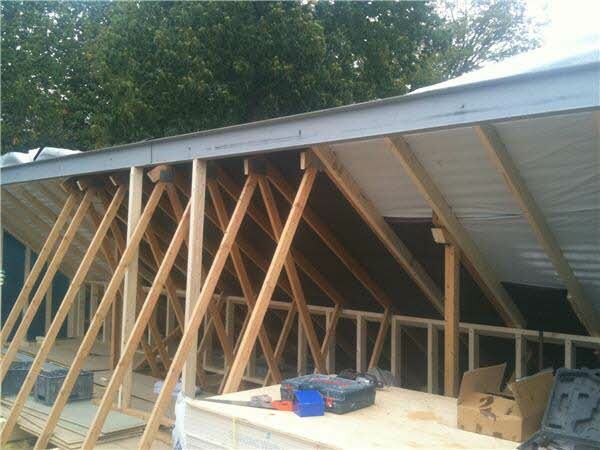 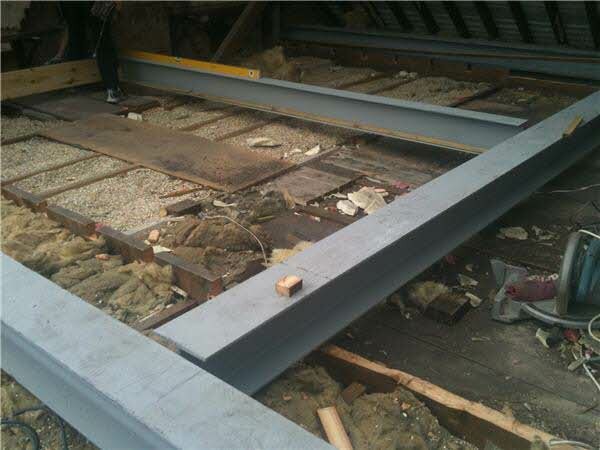 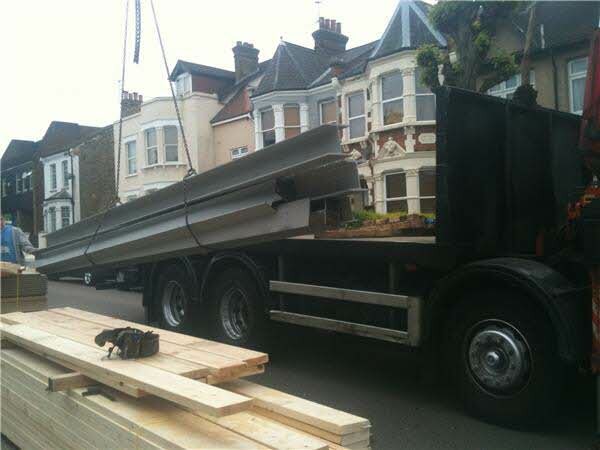 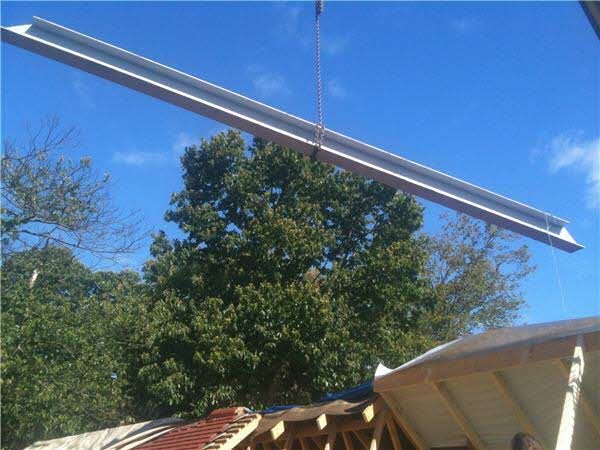 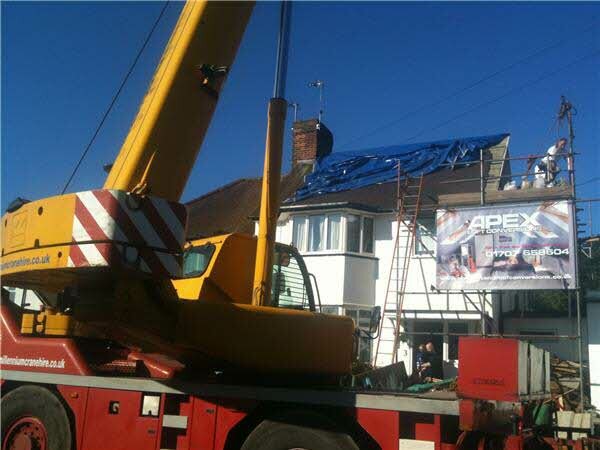 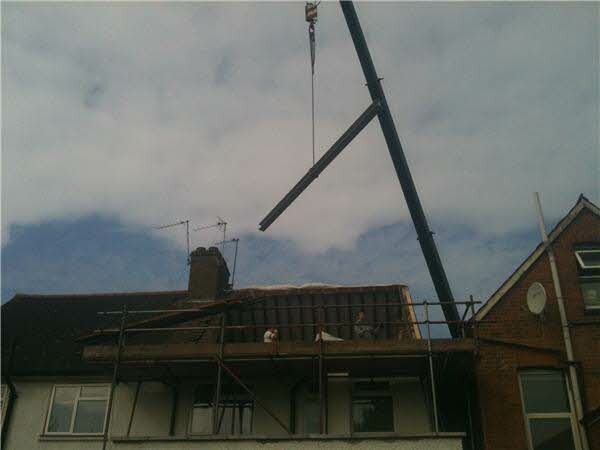 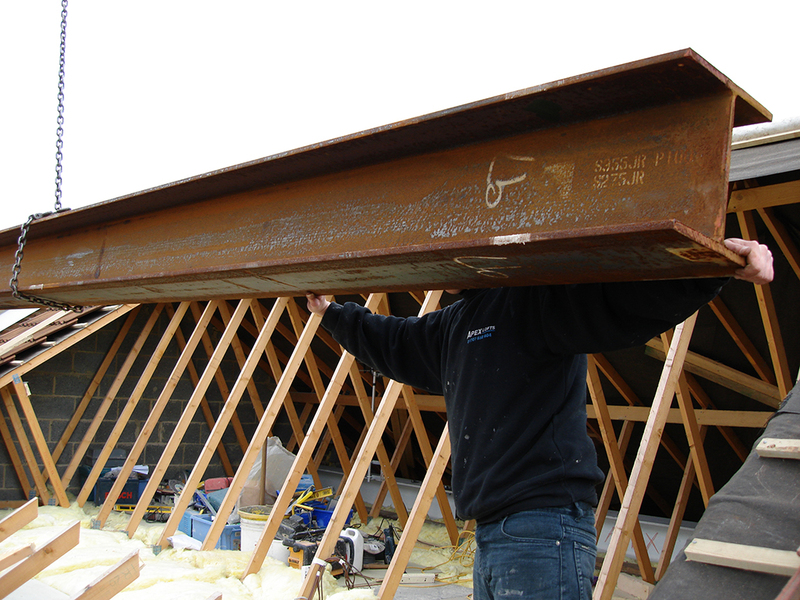 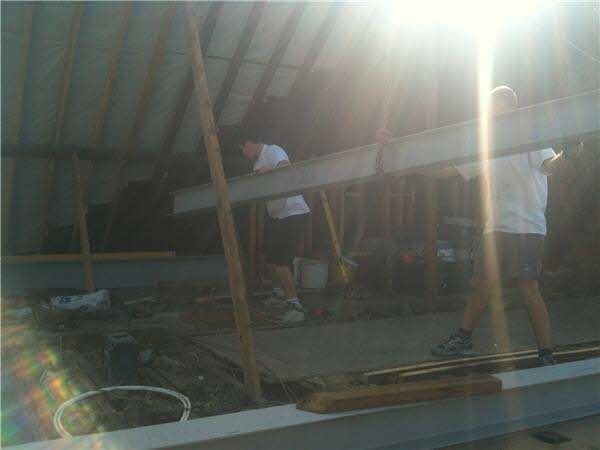 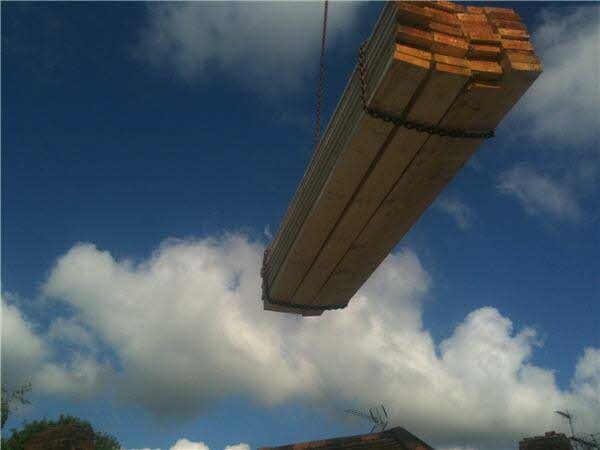 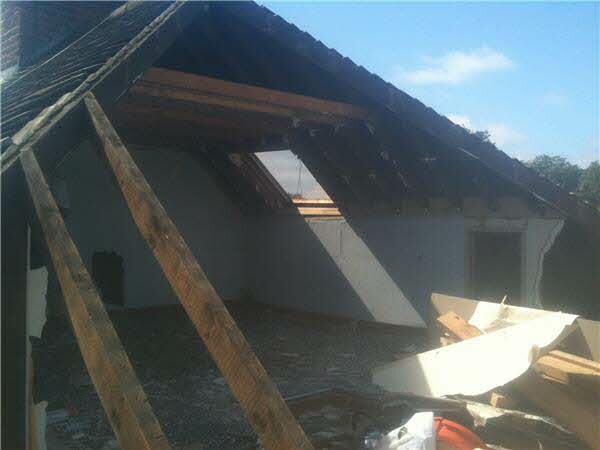 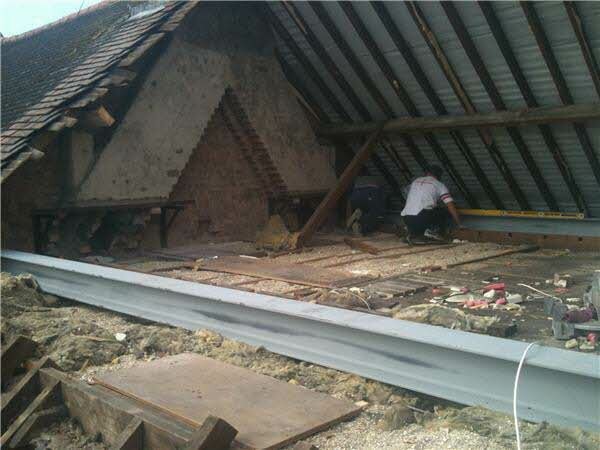 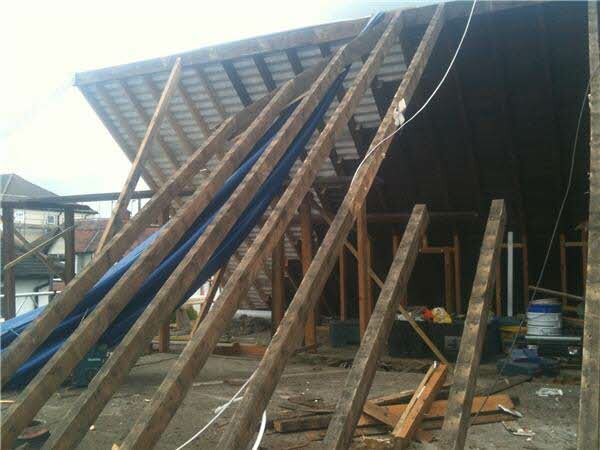 Work on the gable was started, steel beams craned in, and the roof fully exposed as the beams were prepared. 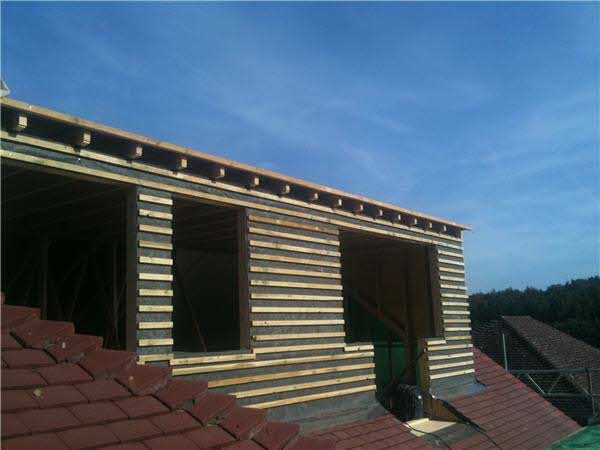 The dormer started taking shape, was ply lined with window openings in place, and then felted and battened, ready to be tile hung. 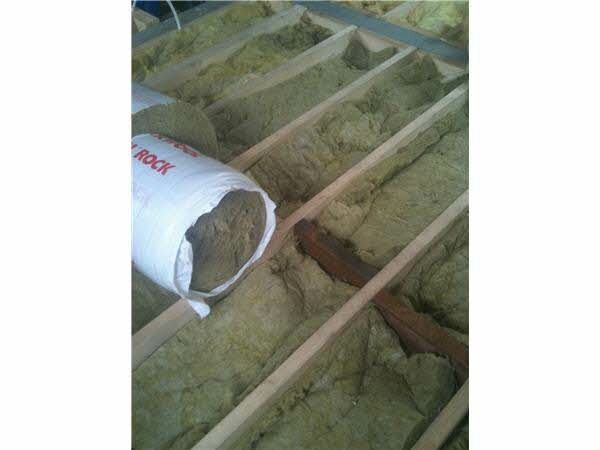 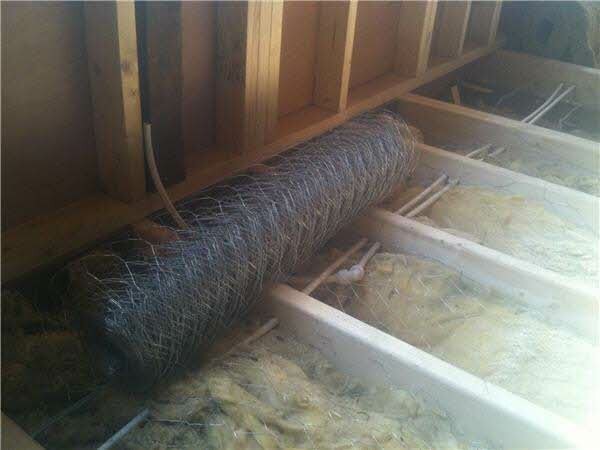 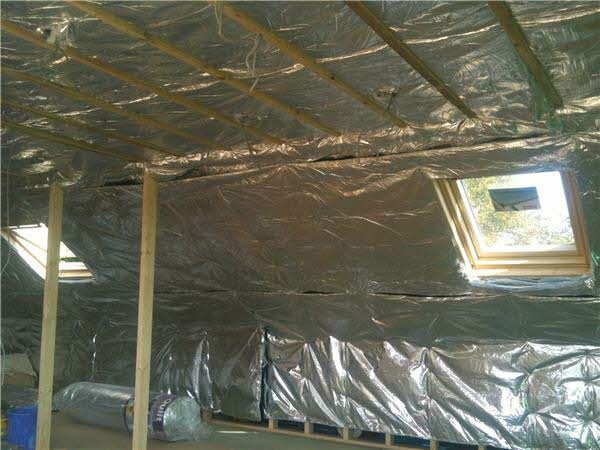 The loft was then insulated. 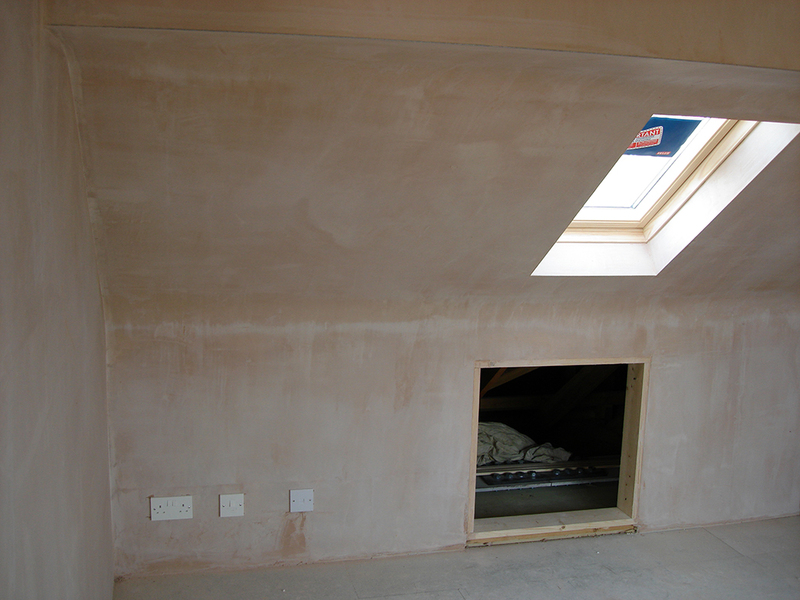 The finished dormer conversion contains a French doors onto a Juliet balcony, shower-room, and new staircase matching the existing one. 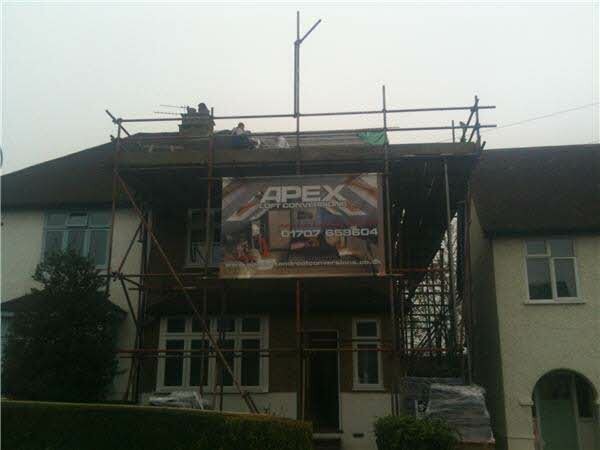 In preparation for this Hip to Gable loft conversion we built in Barnet, scaffolding was erected and the redundant chimney stack removed. 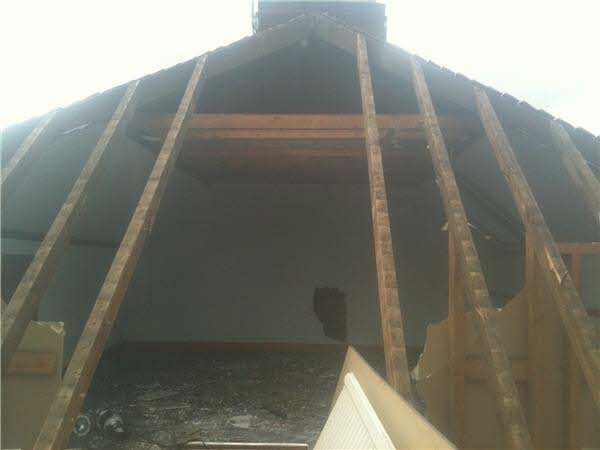 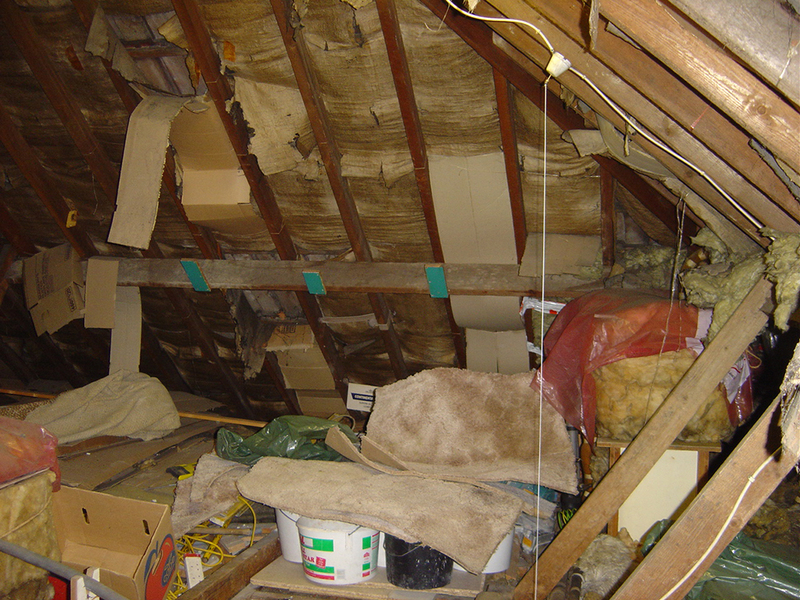 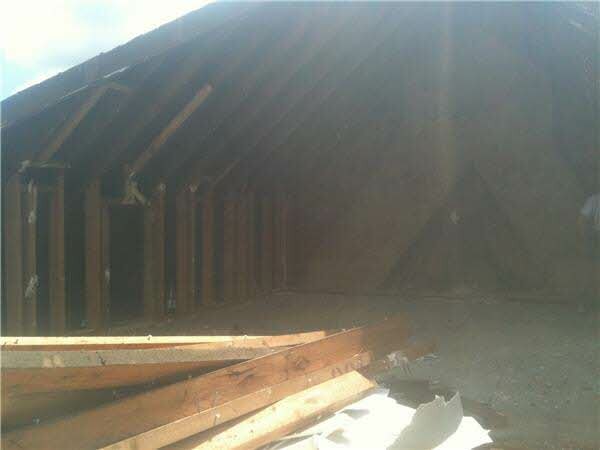 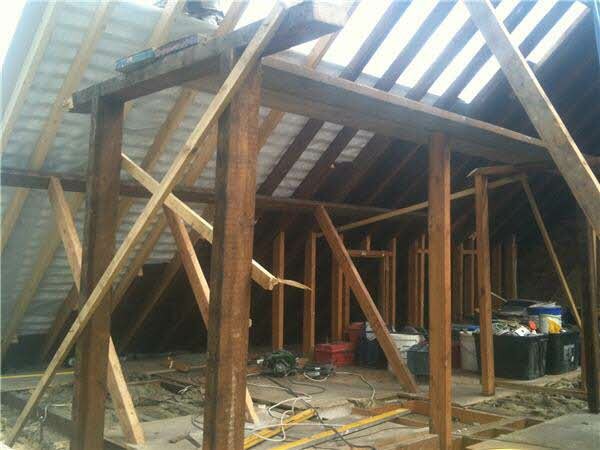 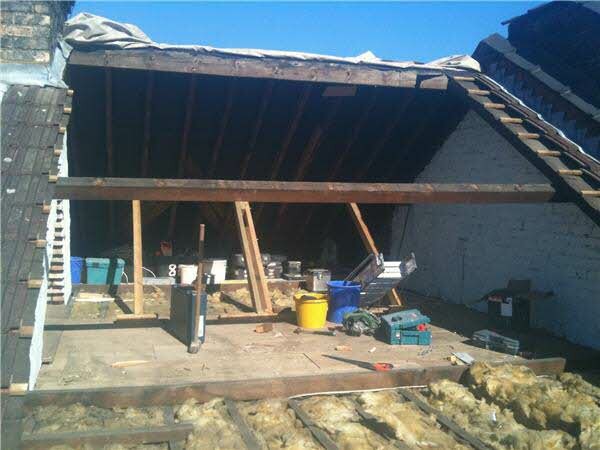 The flank end was stripped and the rafters of the original loft room were exposed before being stripped out to get back to the original roof. 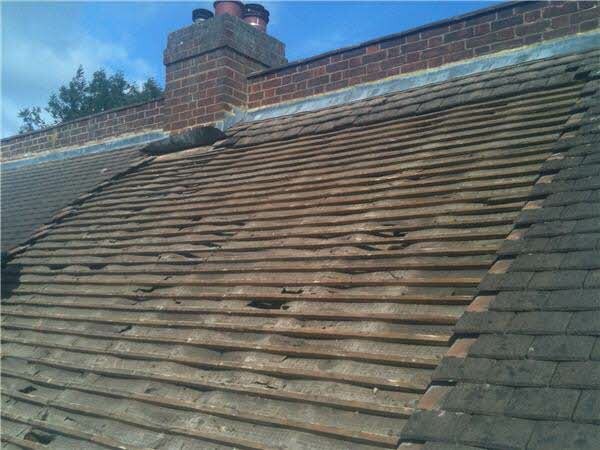 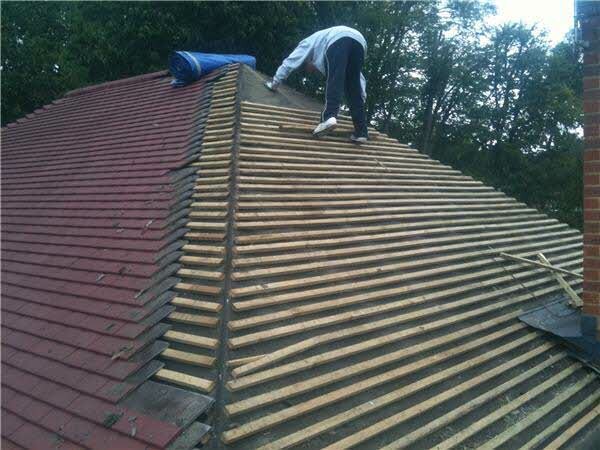 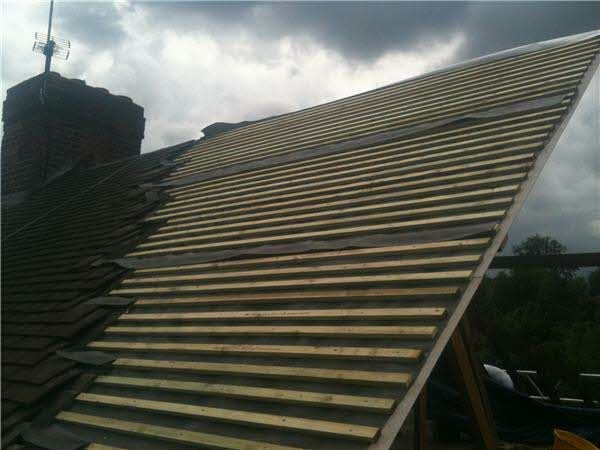 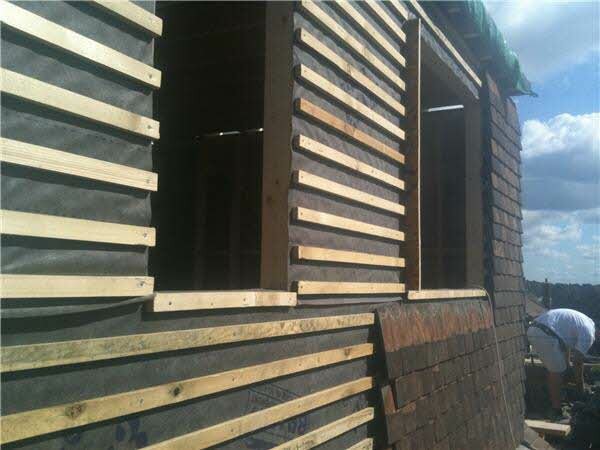 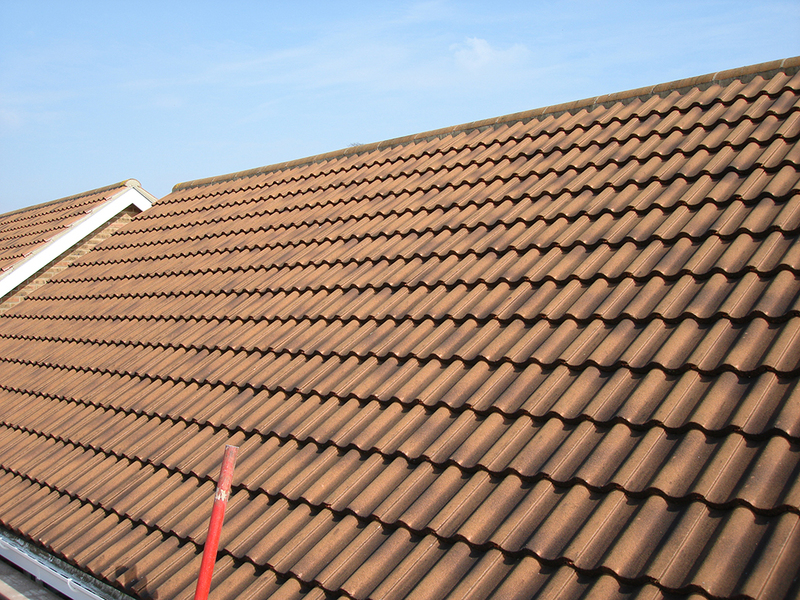 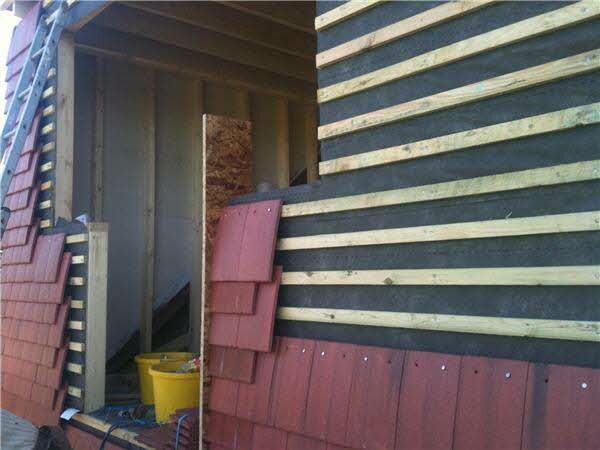 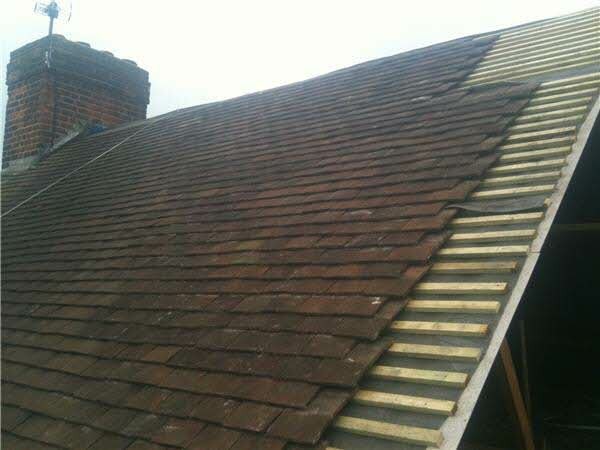 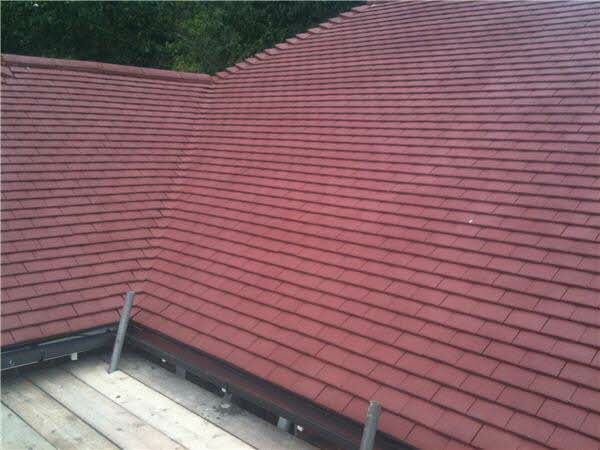 The loft build then started with extending the ridge and main roof to form the gable end, then felt and battening, re-laying the existing tiles to match, and removing the back section. 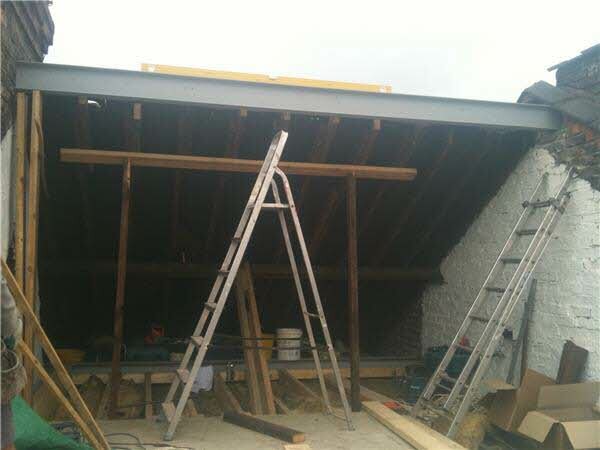 The RSJs (Rolled steel Joists) were then positioned, and the floor joists installed and the work on the rear dormer is started. 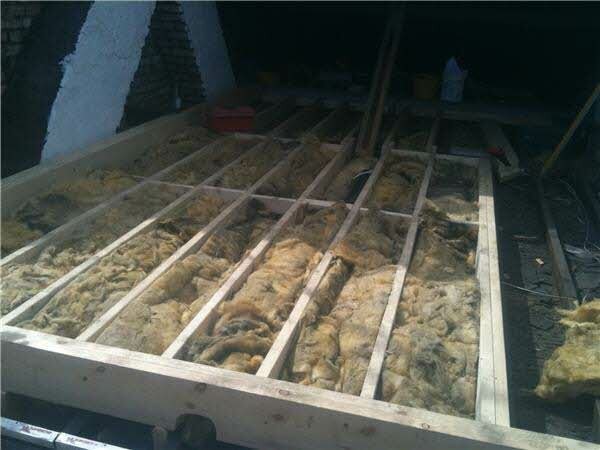 This too is felted and battened, ready to be tile hung, exposing the pitch roof to fit the Velux windows. 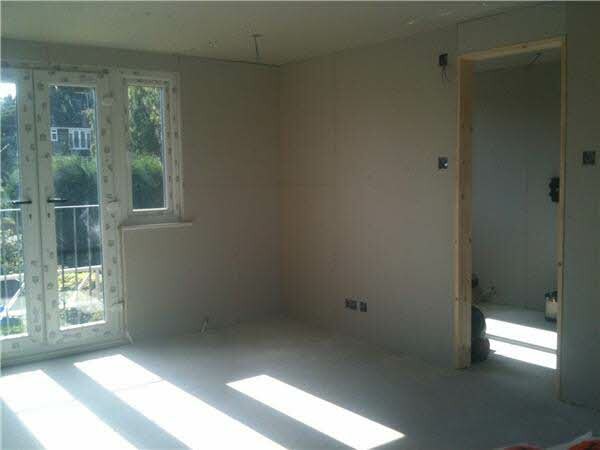 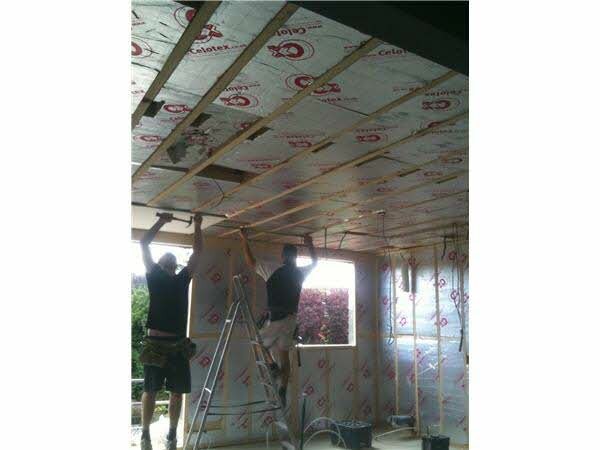 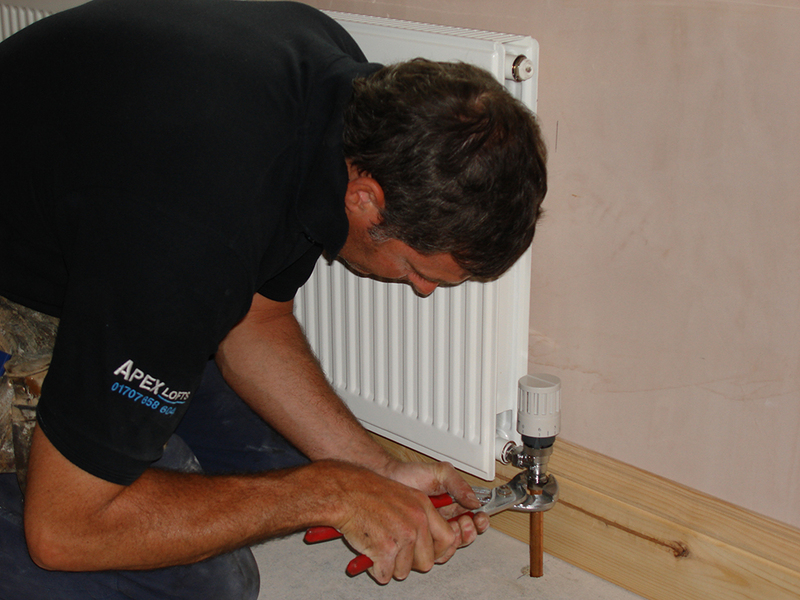 The installation is then finished by laying floorboards, Celotext insulation, plasterboarding the ceilings and walls, tiling done, windows fitted, French doors fitted. 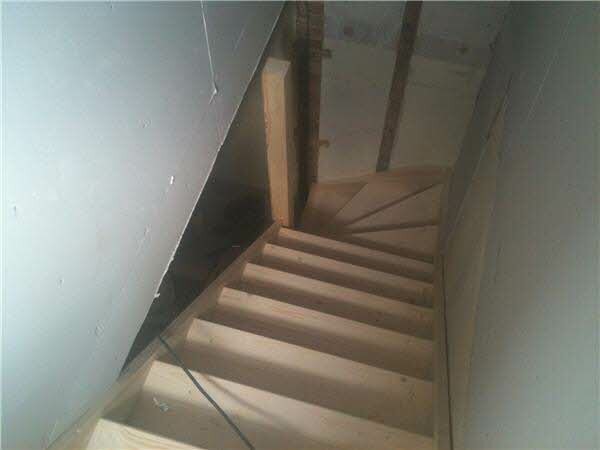 Finally the staircase is fitted and the internal walls built to divide the en-suite bathroom from the bedroom before plastering and decorating completes the job. 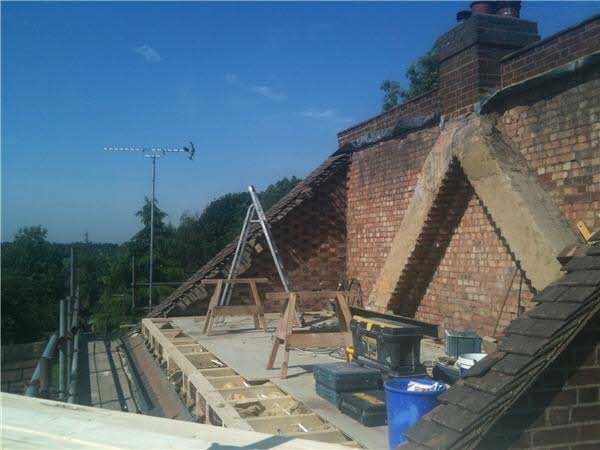 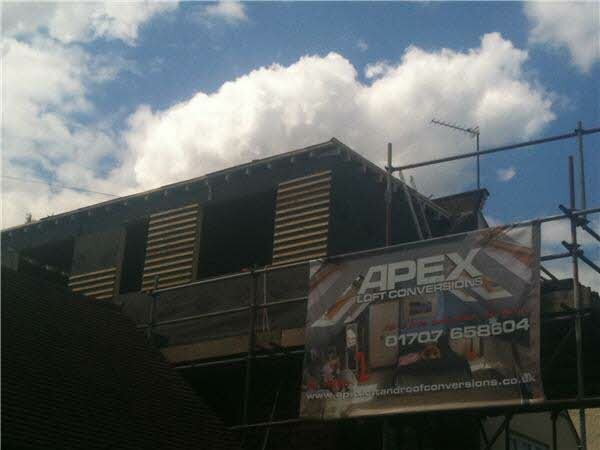 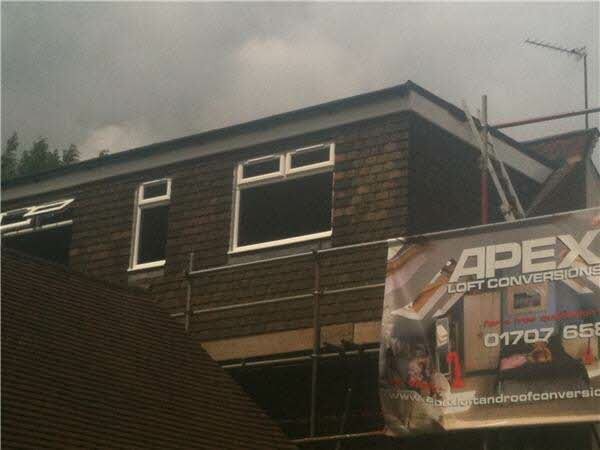 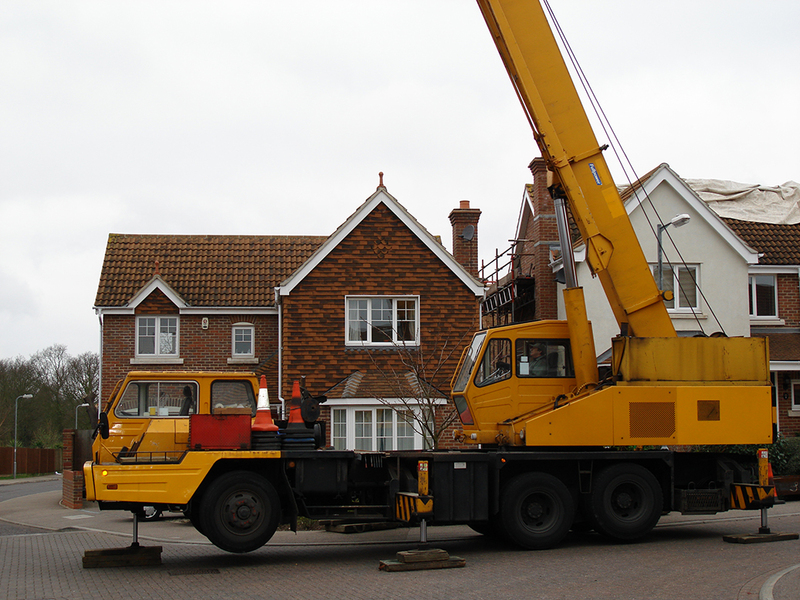 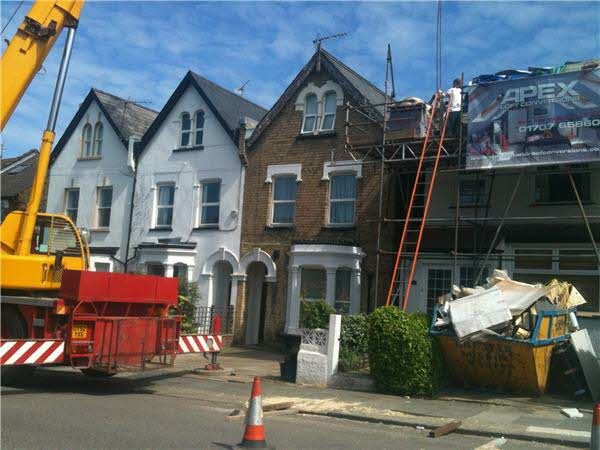 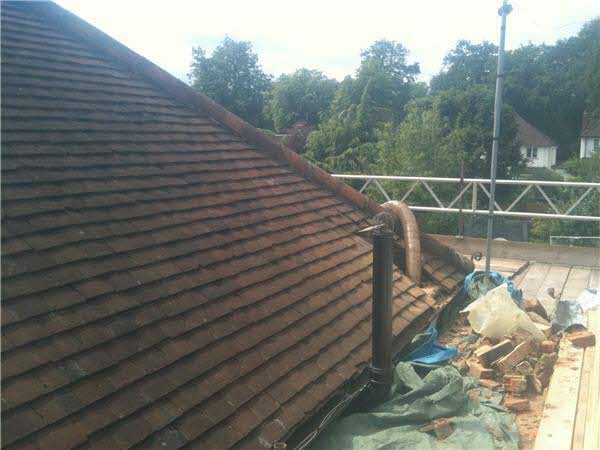 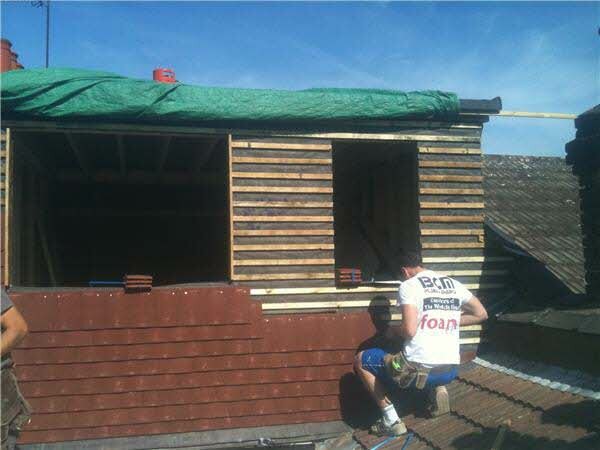 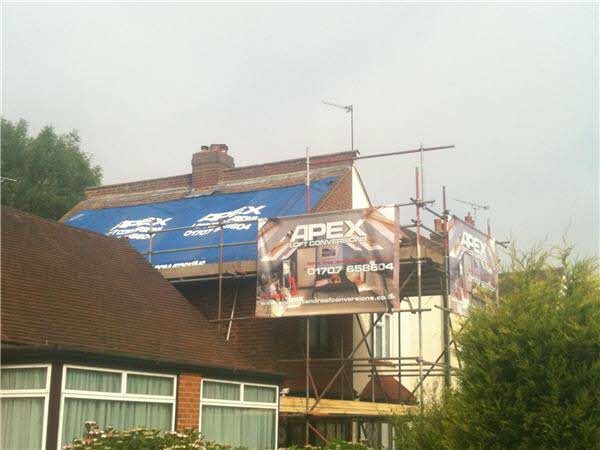 Work started on this gable end and rear dormer extension in St Albans with removal of the roof tiles and existing roof. 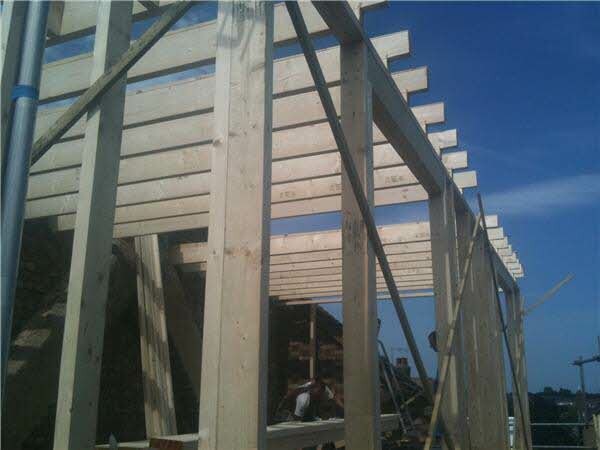 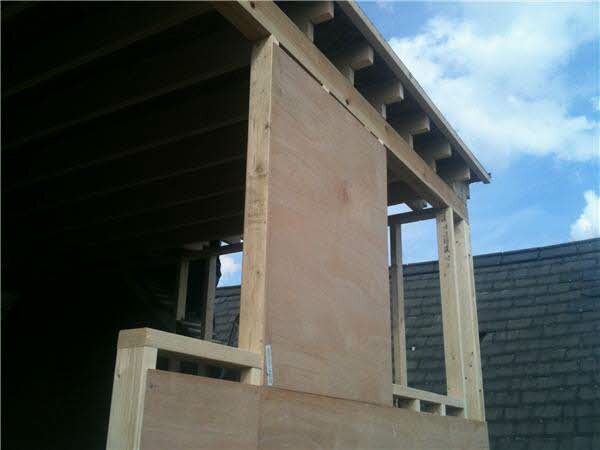 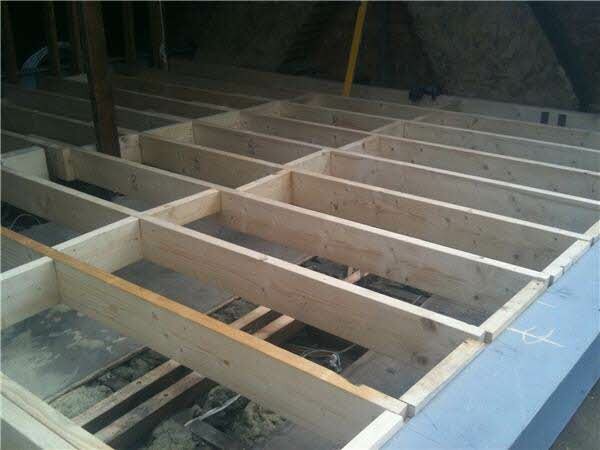 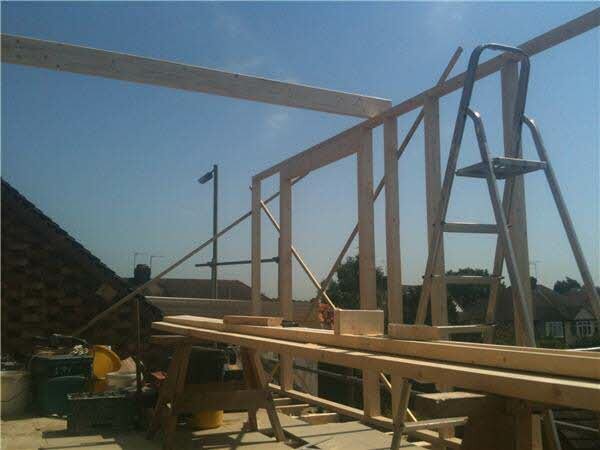 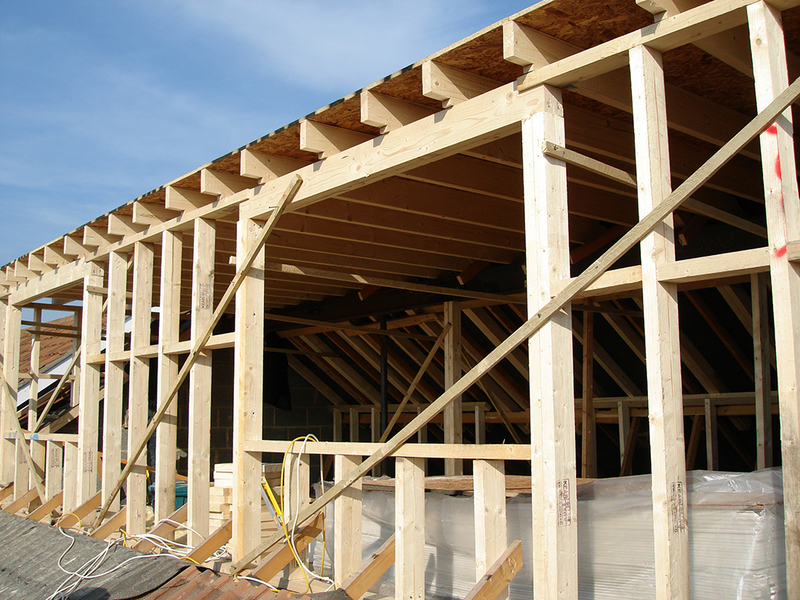 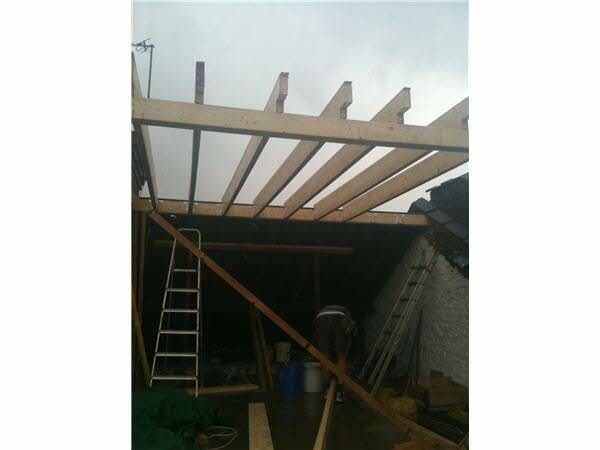 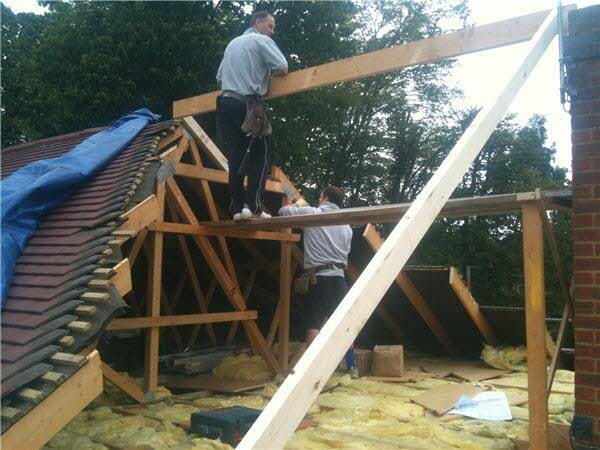 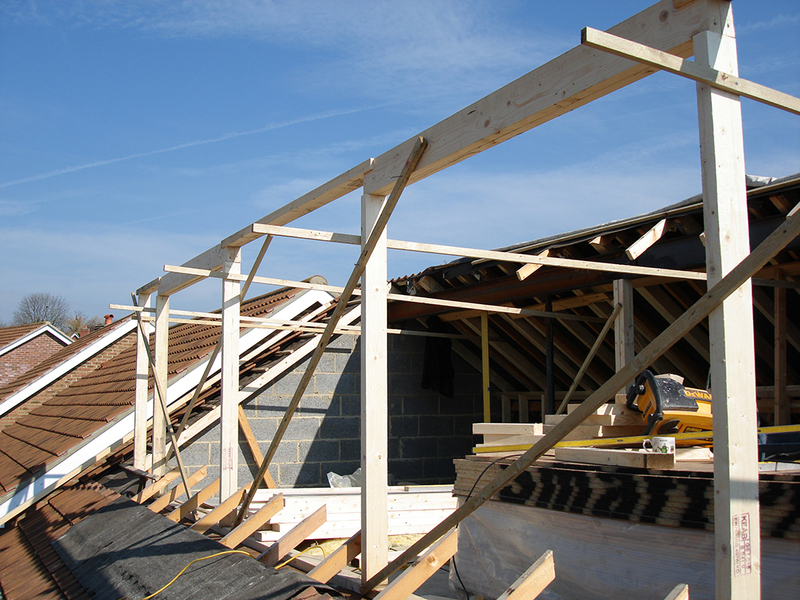 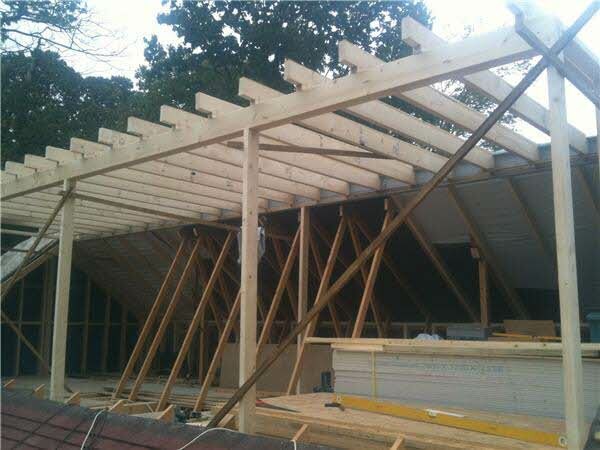 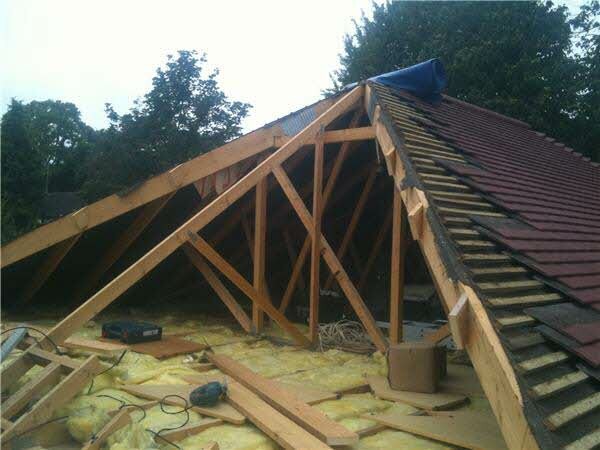 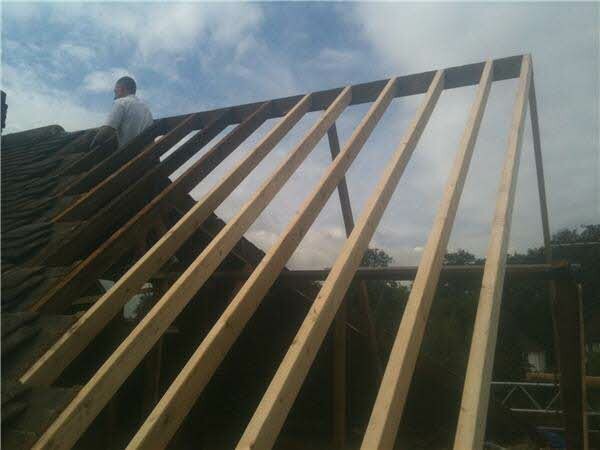 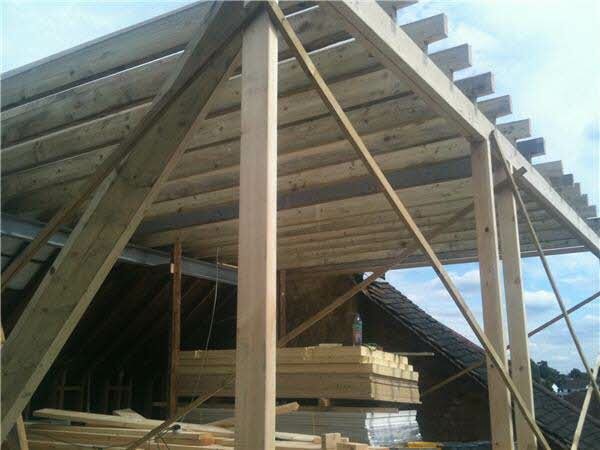 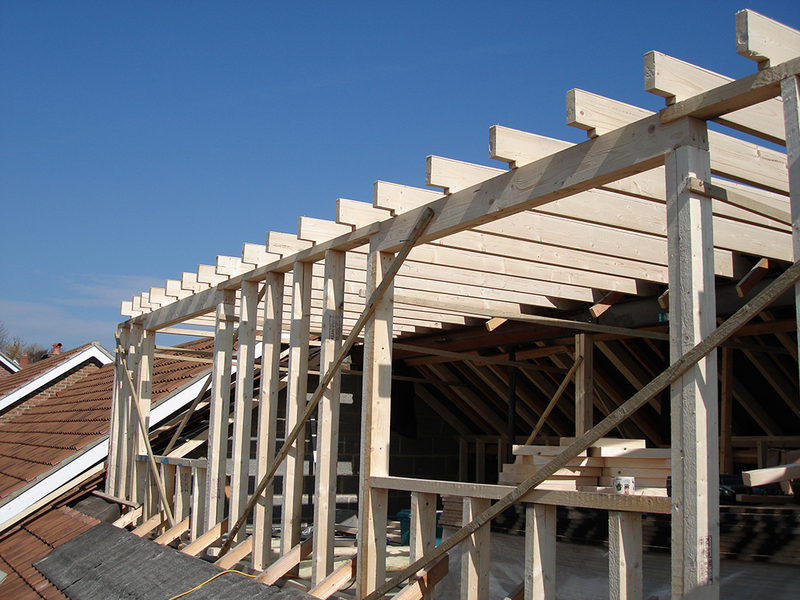 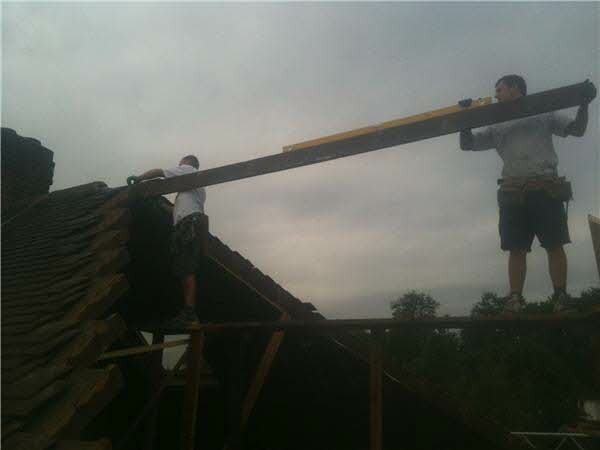 The front frame of the dormer then went up, followed by the dormer joists. 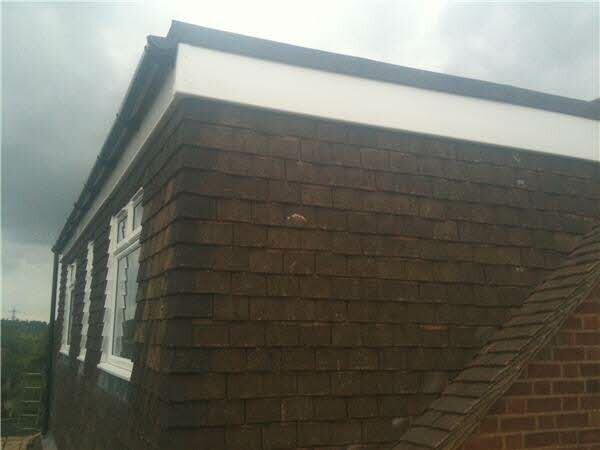 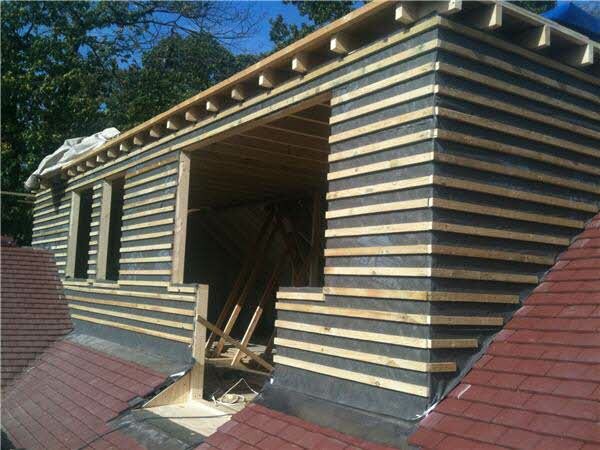 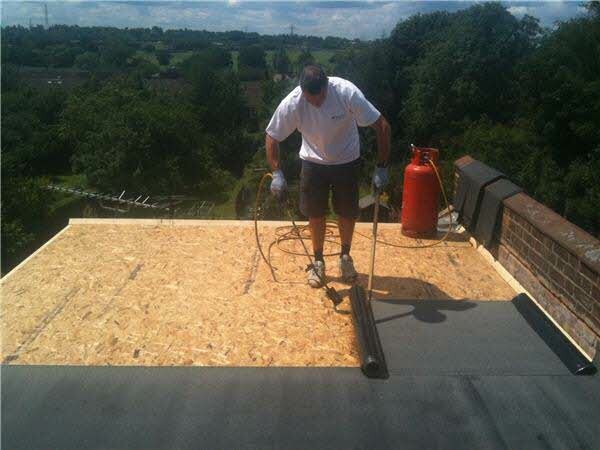 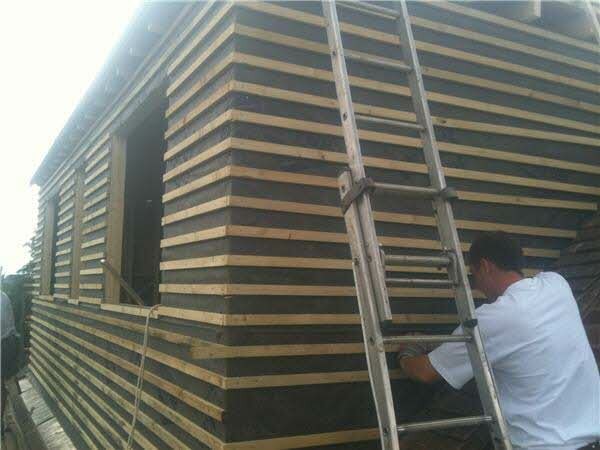 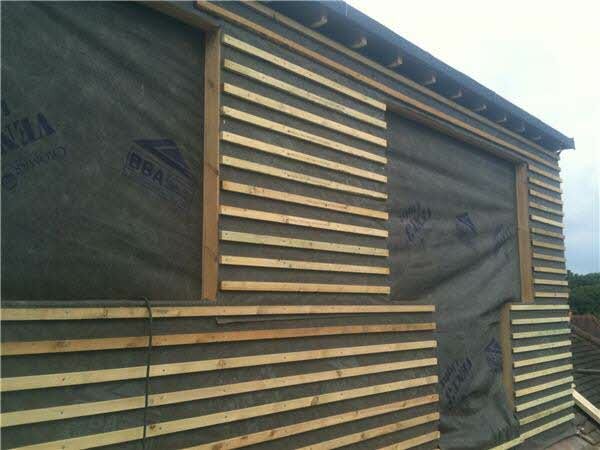 The dormer was ply lined and wrapped in felt, battened and the flat roof weathered. 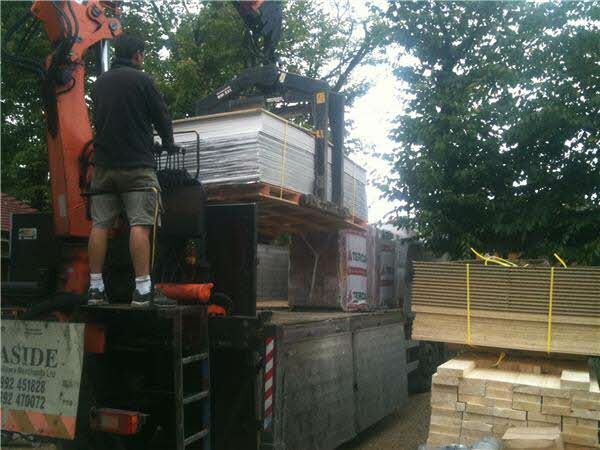 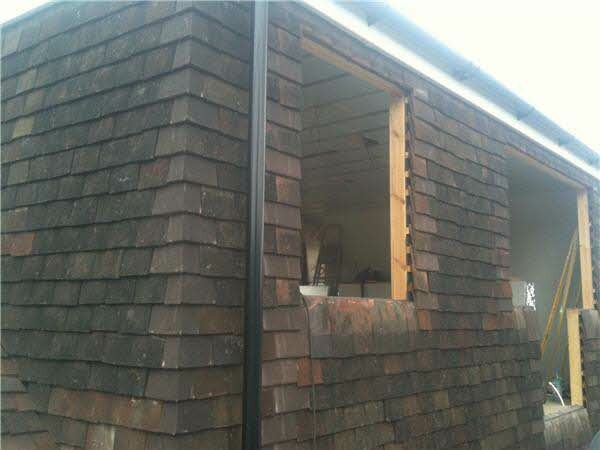 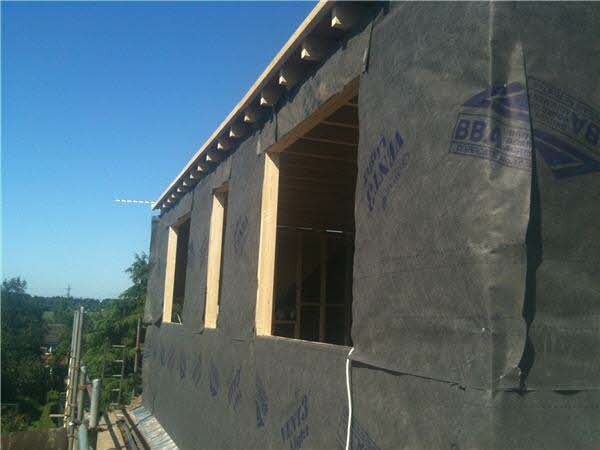 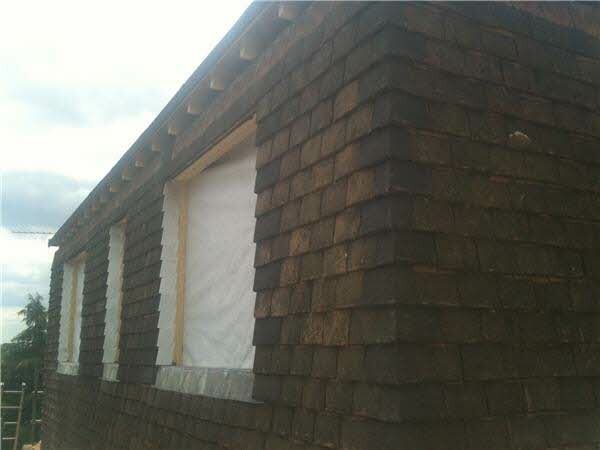 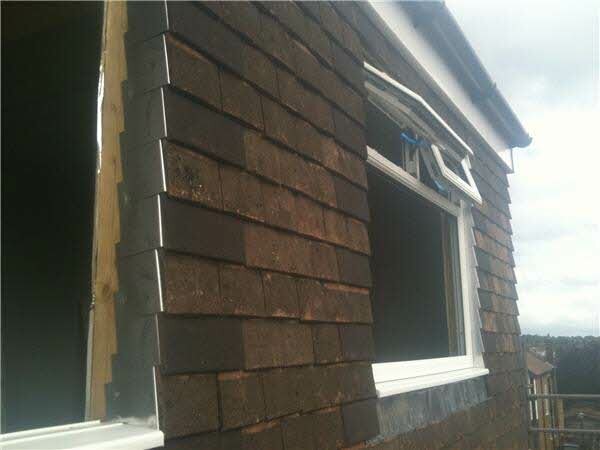 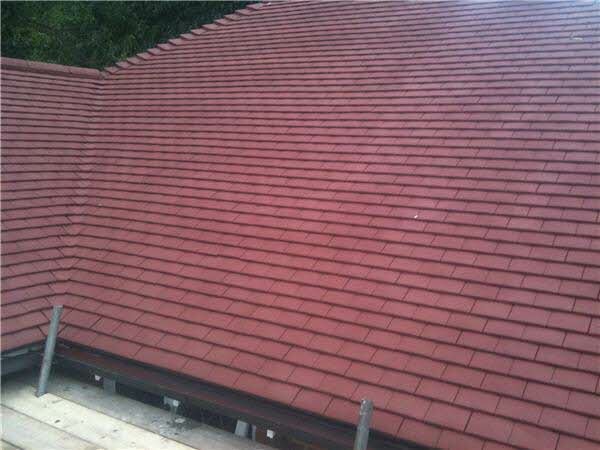 The dormer was tile hung and the openings made ready to take the windows. 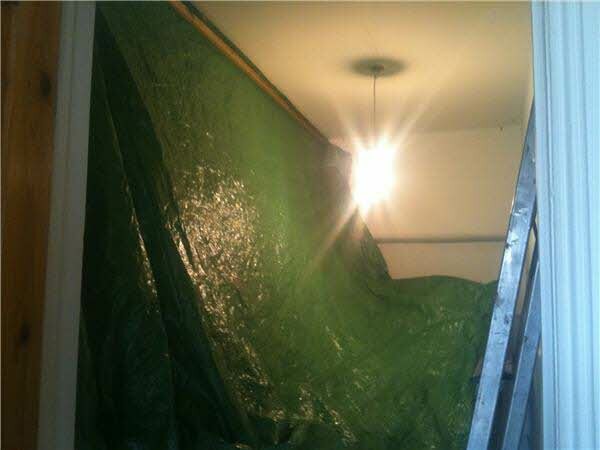 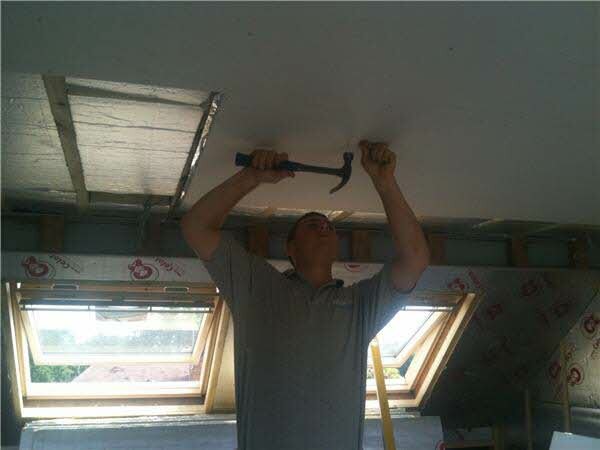 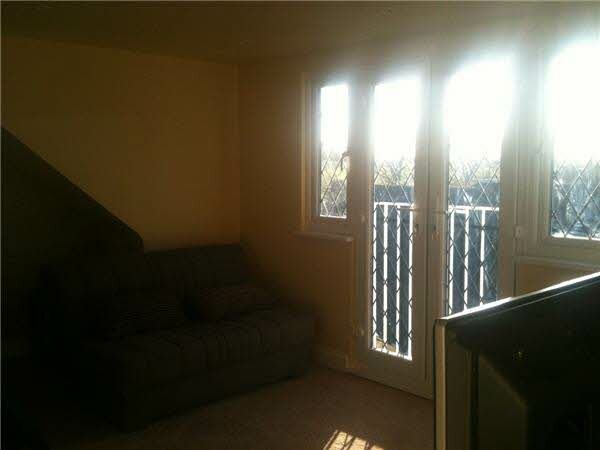 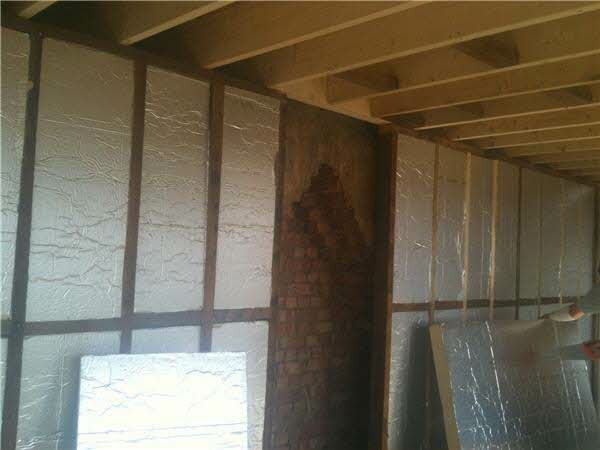 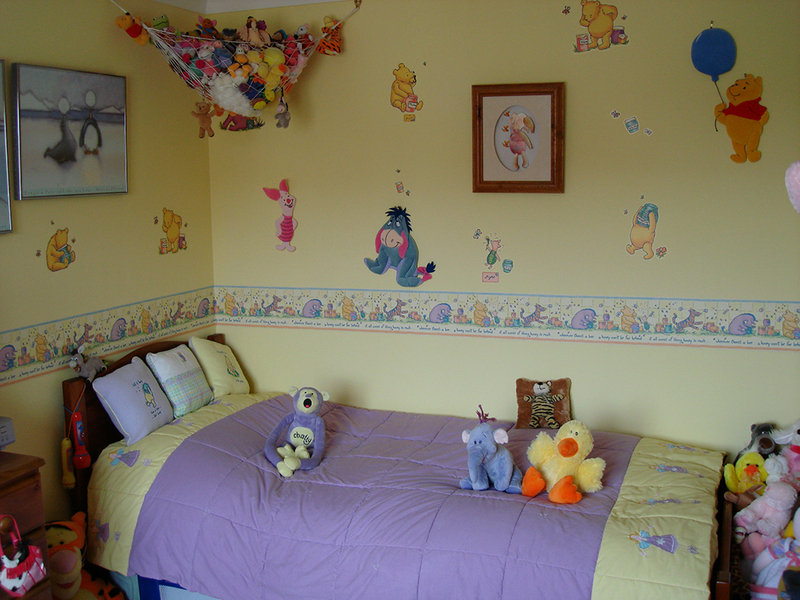 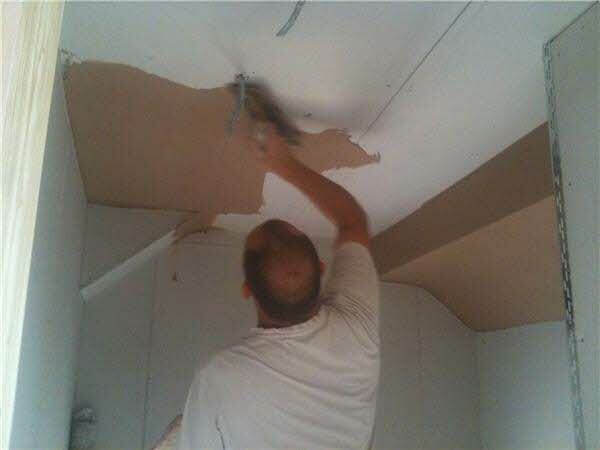 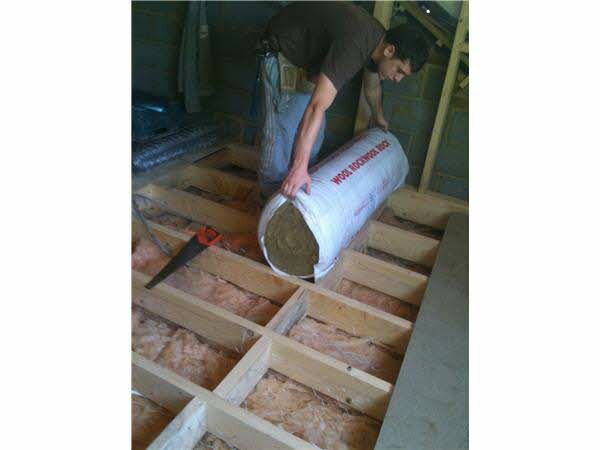 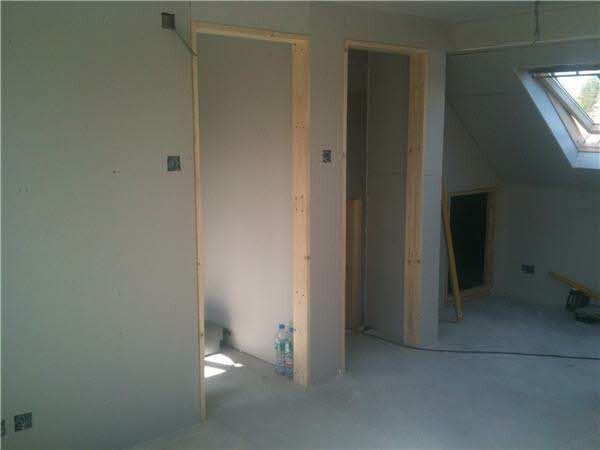 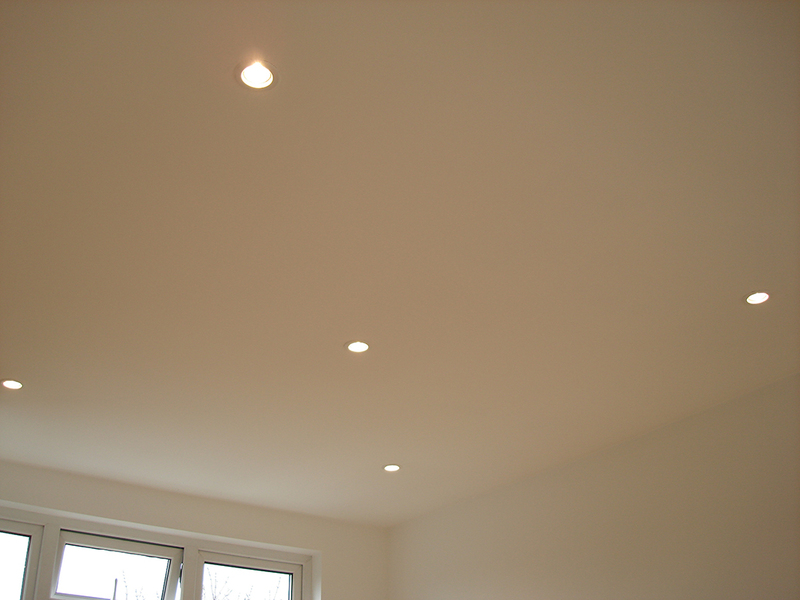 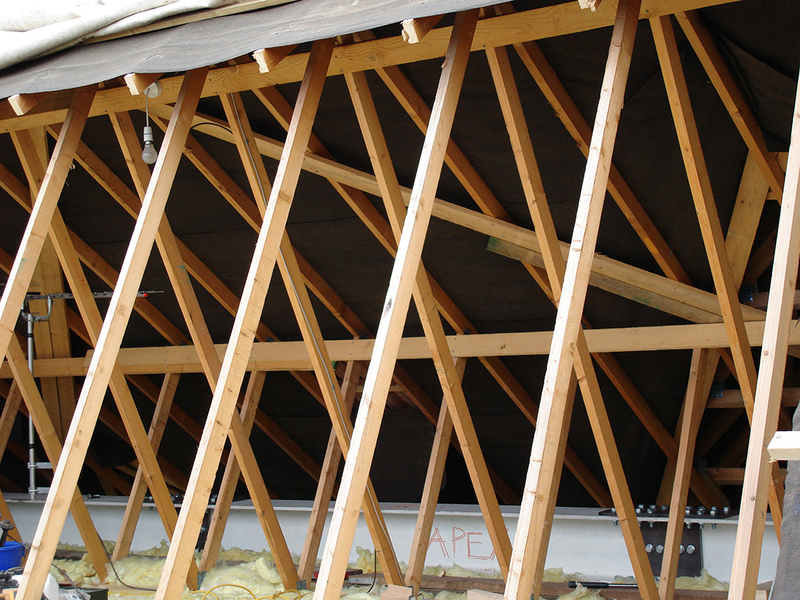 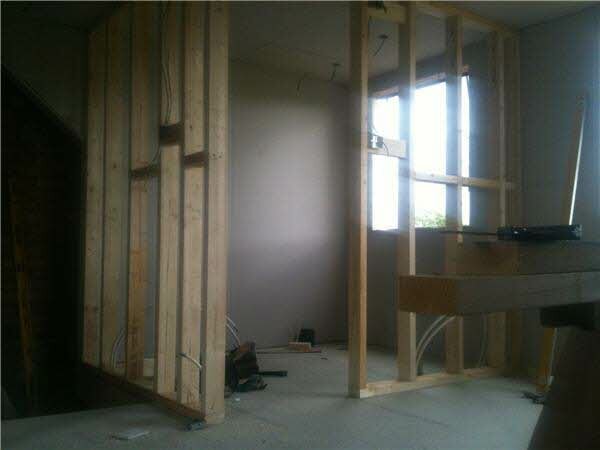 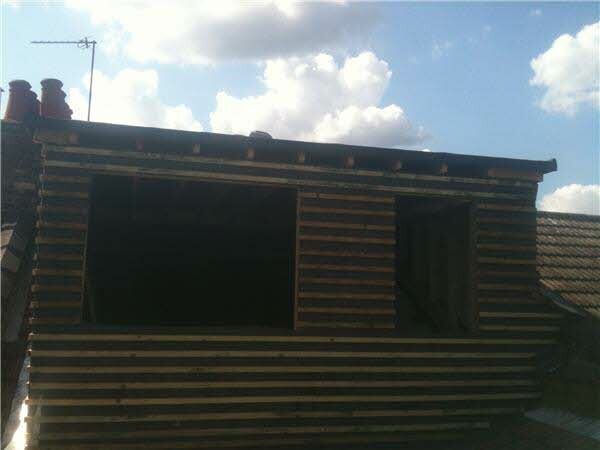 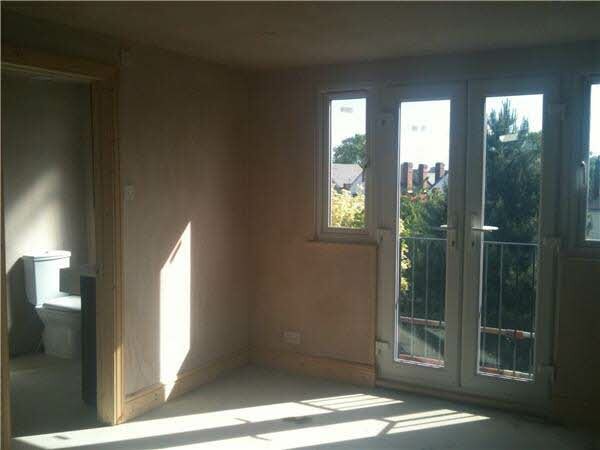 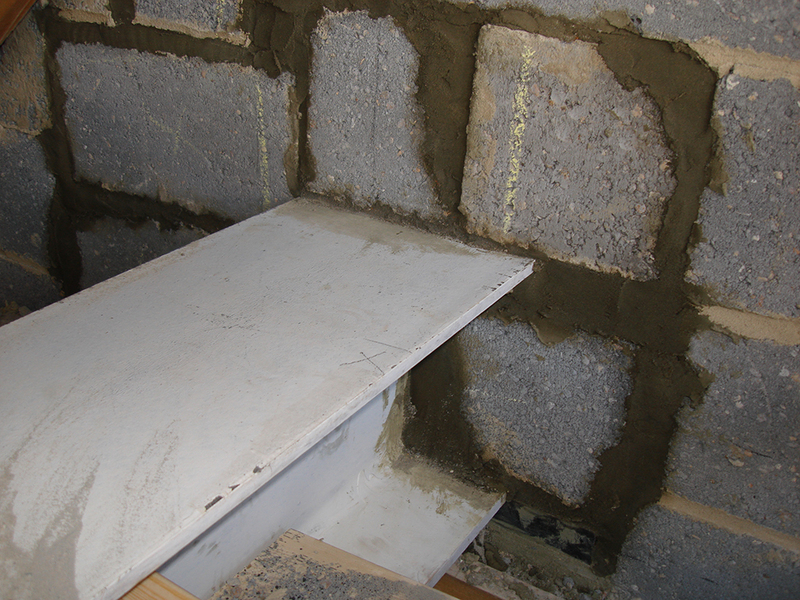 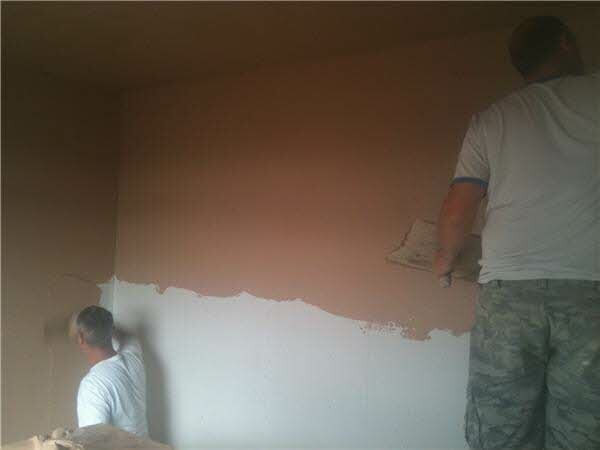 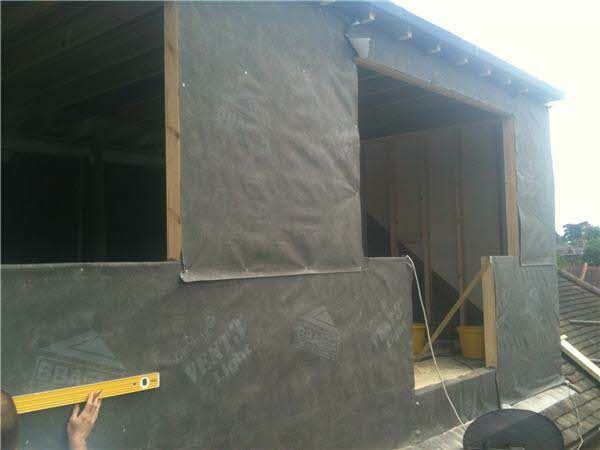 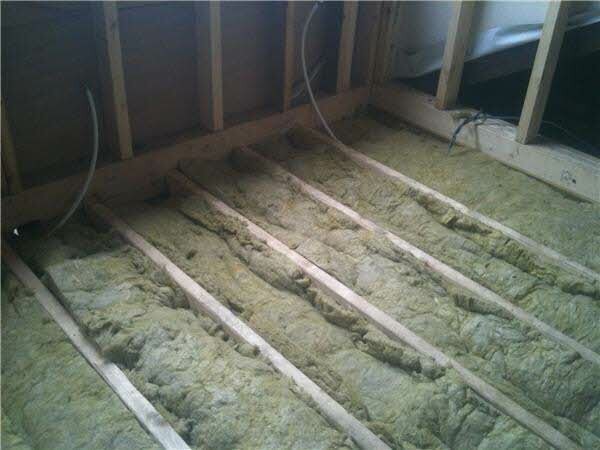 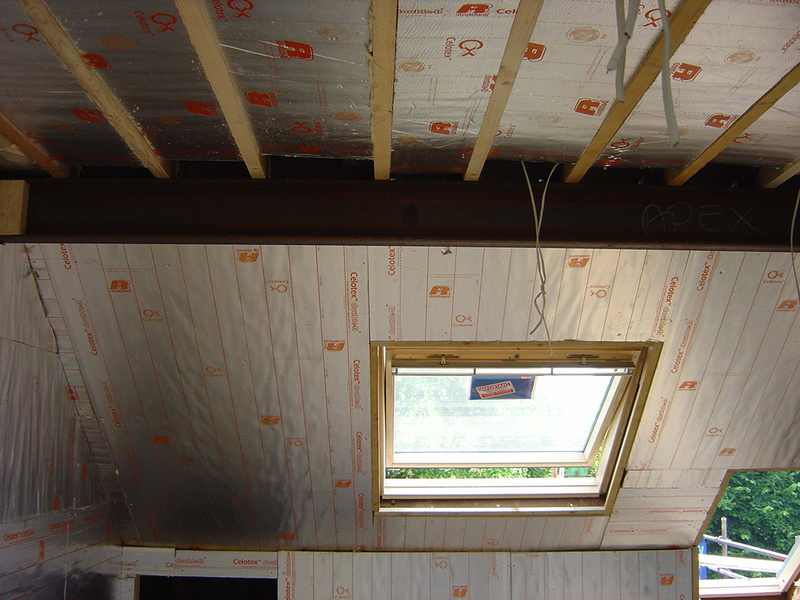 The floor was sound proofed, the loft insulated, and the ceilings and walls plaster-boarded. 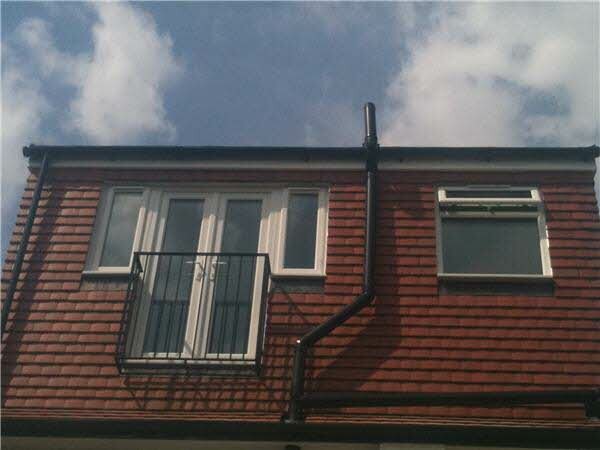 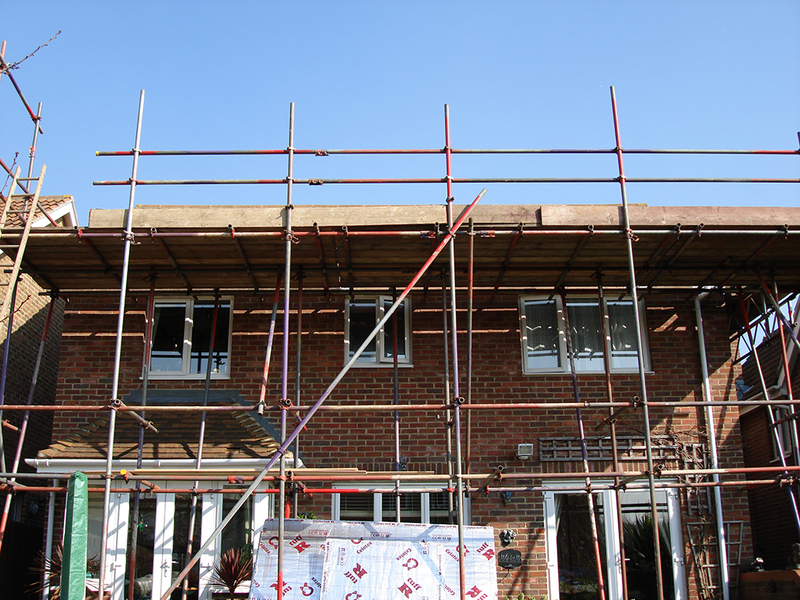 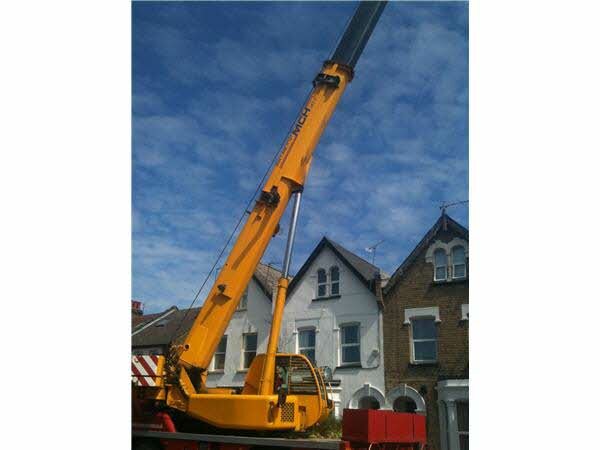 Fascia, gutters and windows were fitted, and once the staircase had been fitted, plastering began. 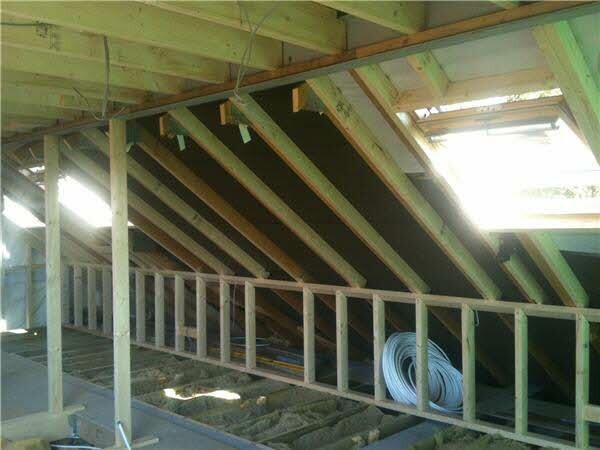 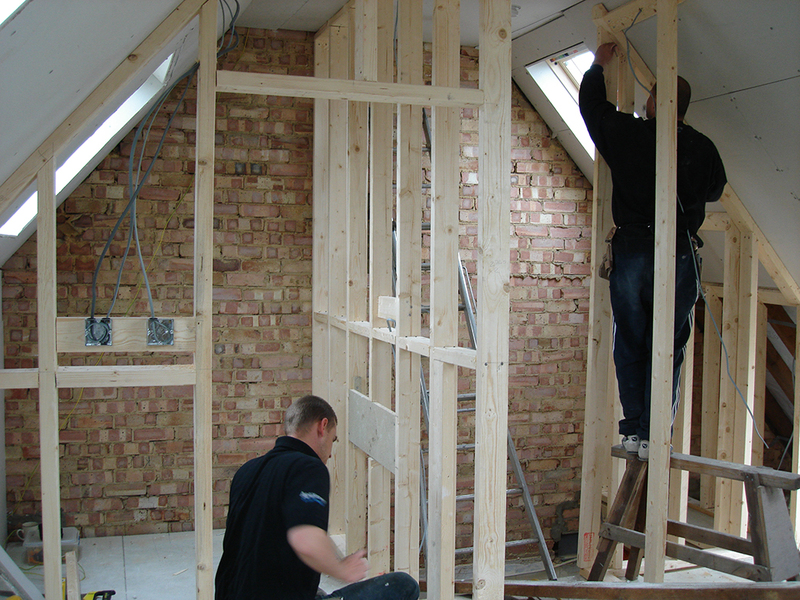 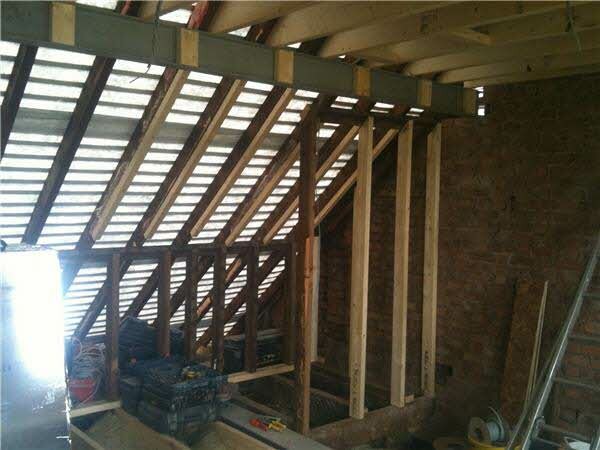 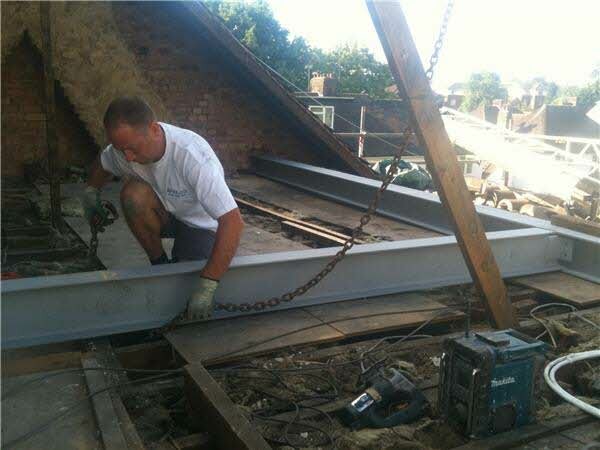 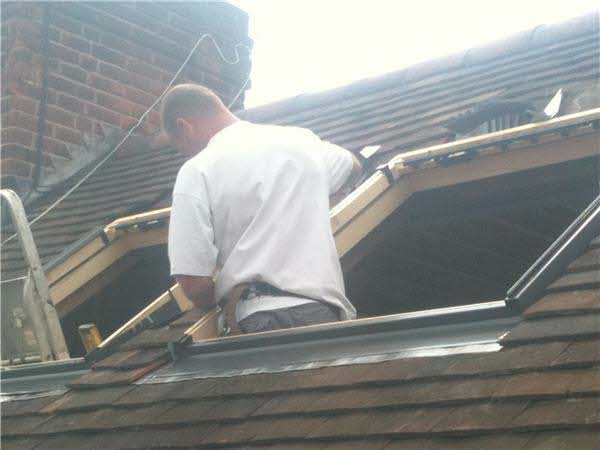 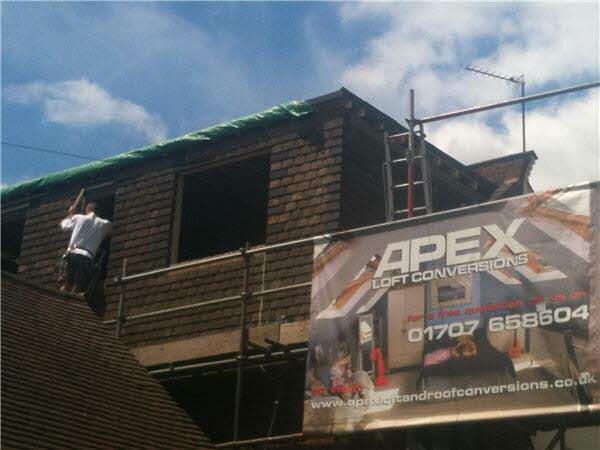 This rear dormer loft conversion in Bounds Green N11 near Enfield started with the tiles being stripped and rafters removed, after which the floor joists were put in and the ridge beam installed. 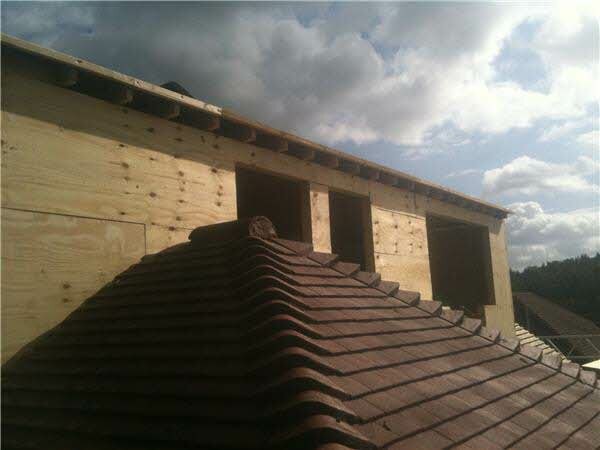 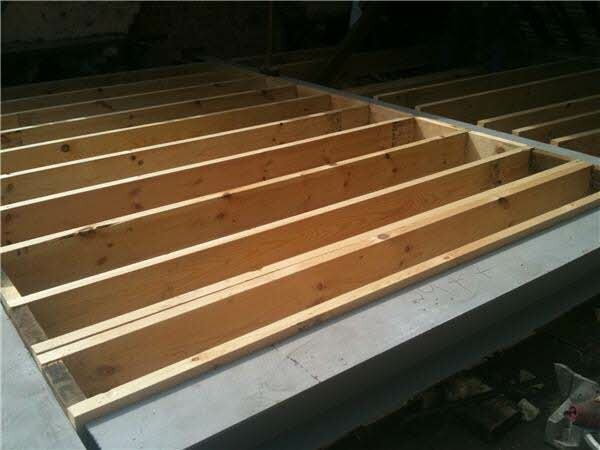 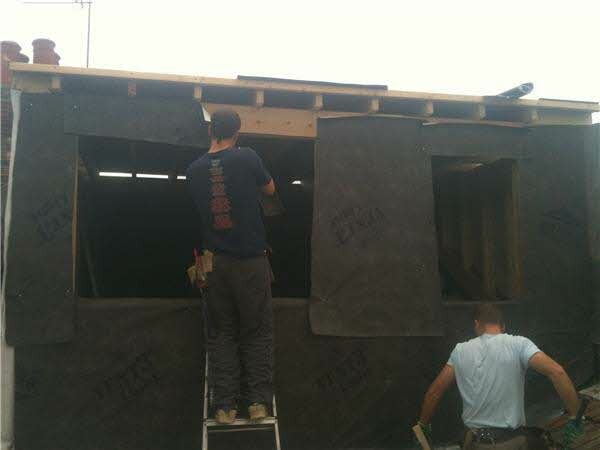 The dormer joists were put in and the dormer built, felt and battened, and tile hung. 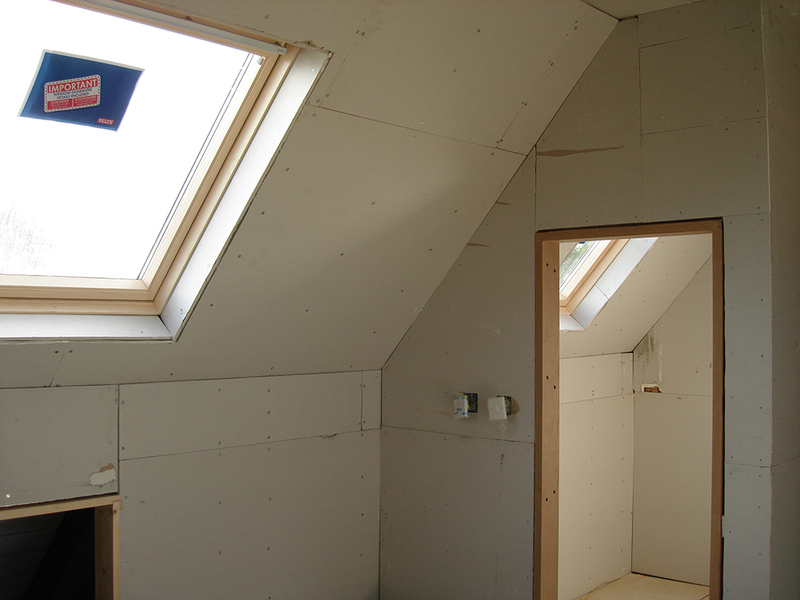 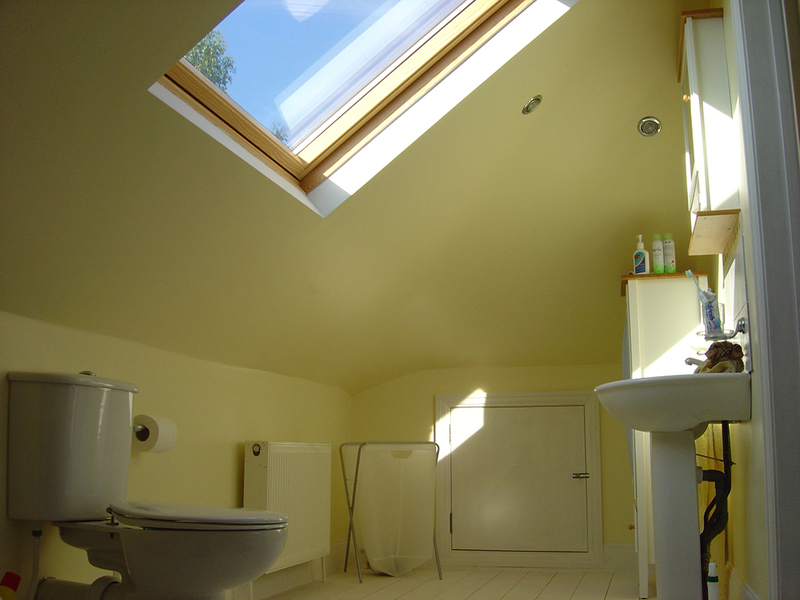 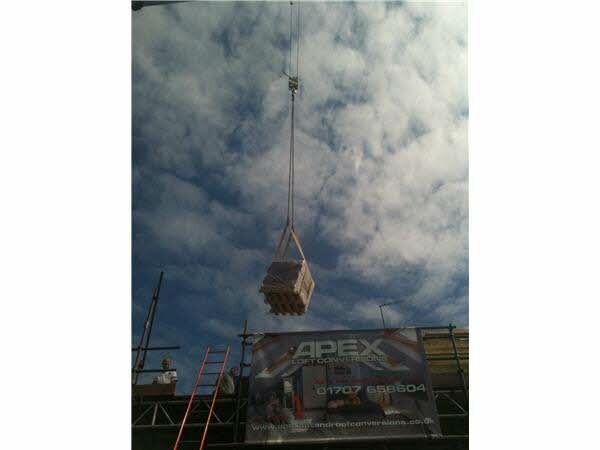 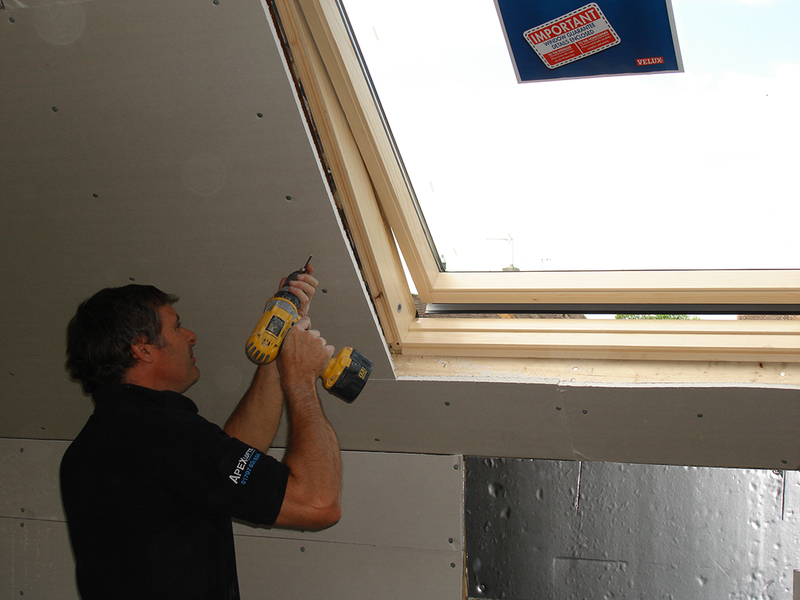 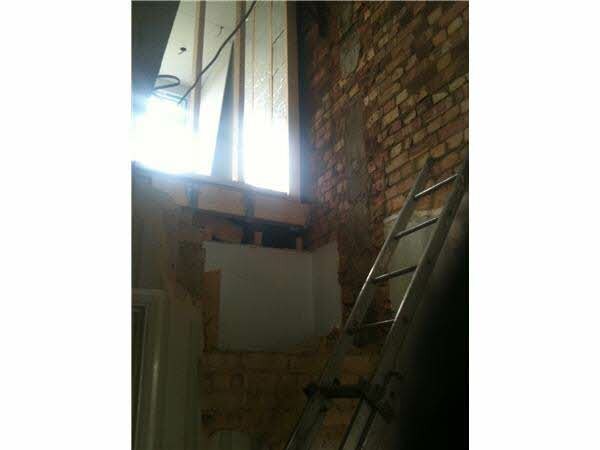 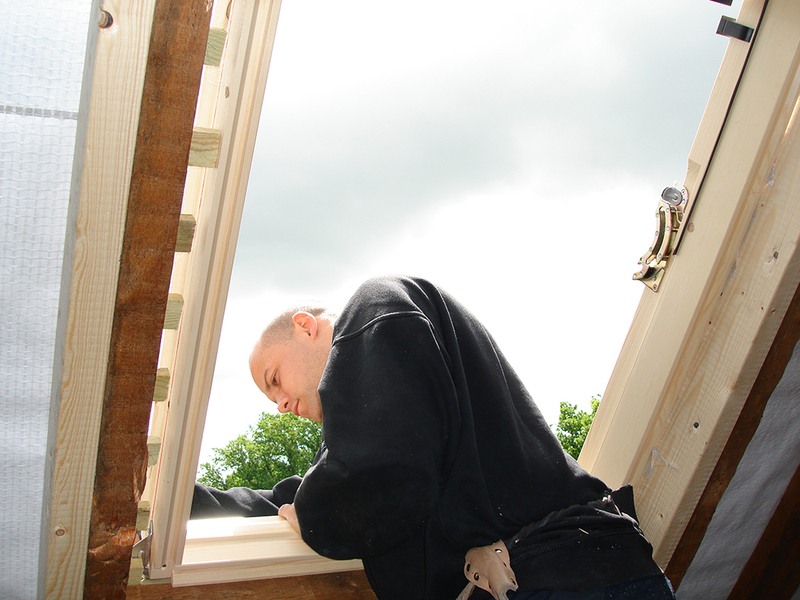 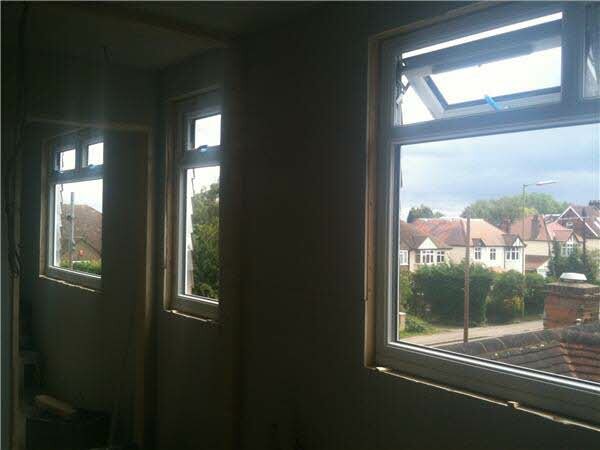 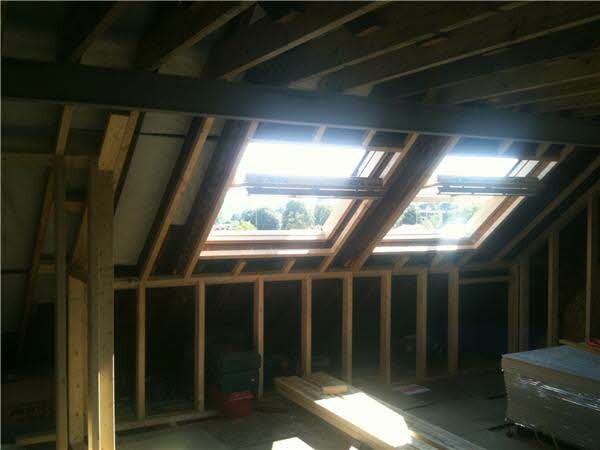 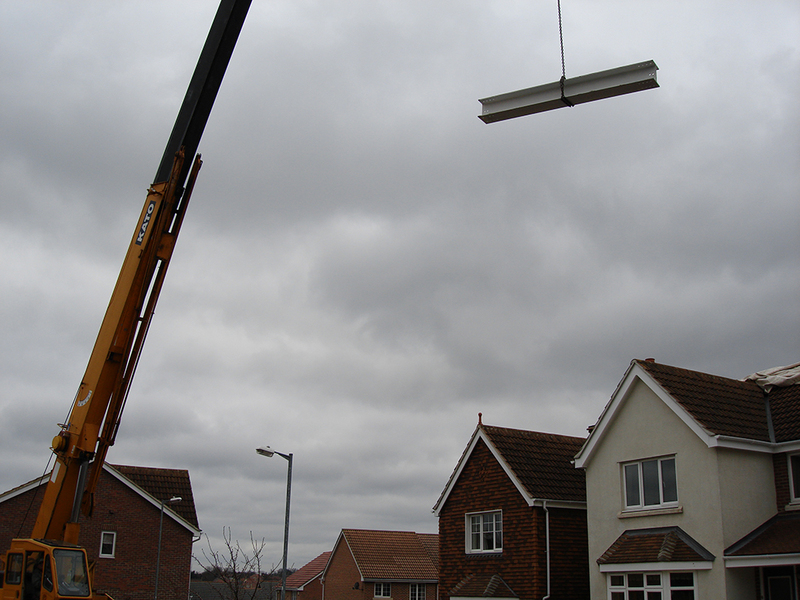 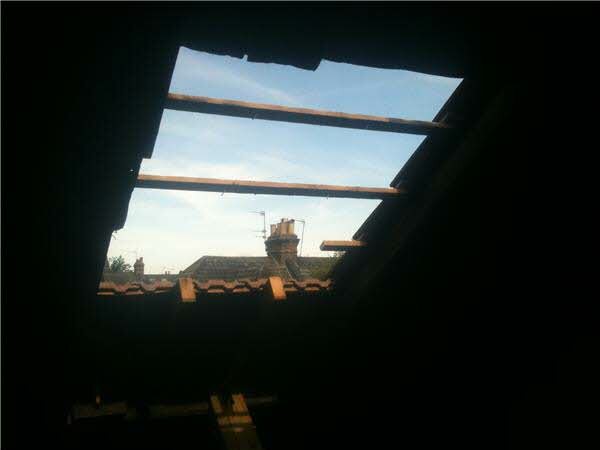 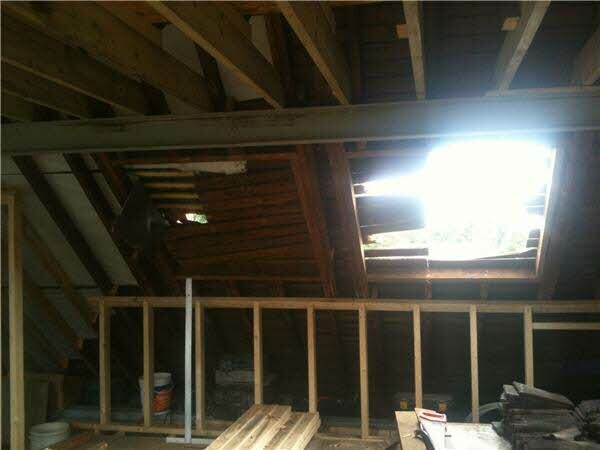 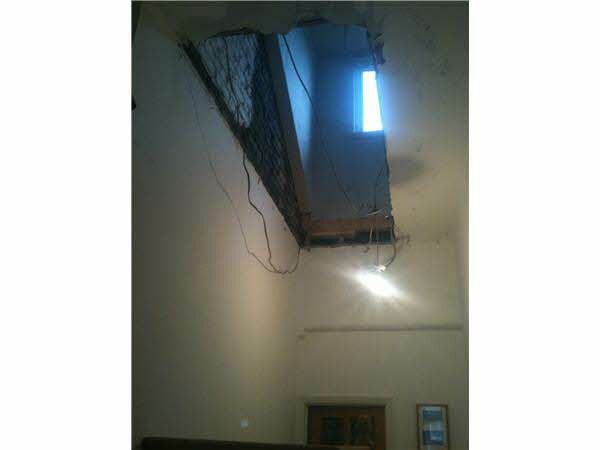 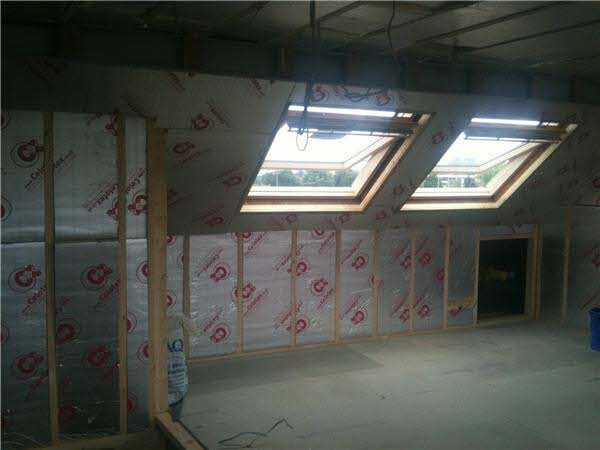 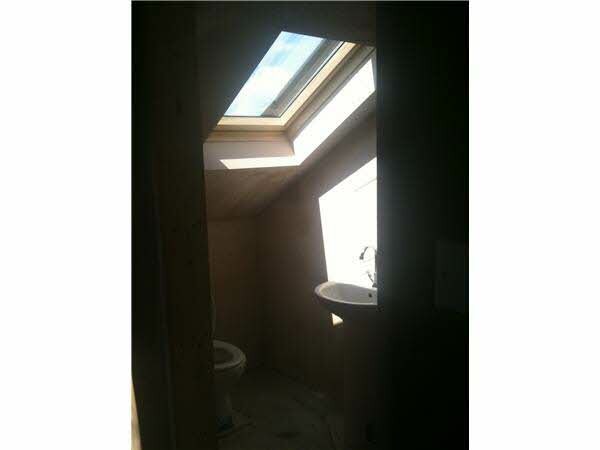 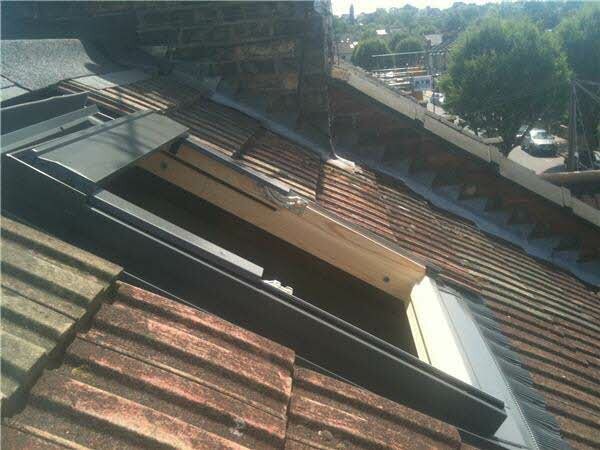 The Velux window was put in, the floor sound proofed, and a stairwell ceiling cut and removed. 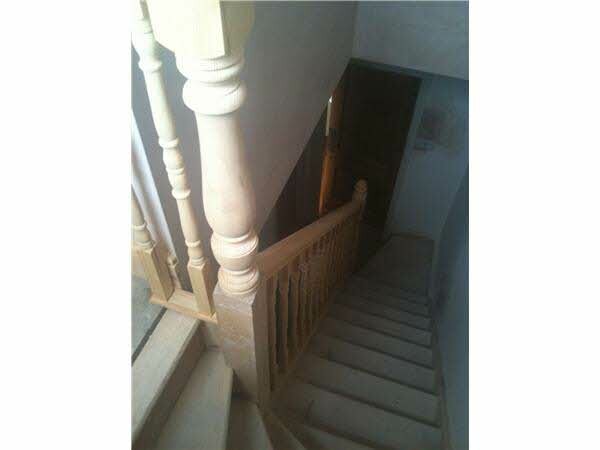 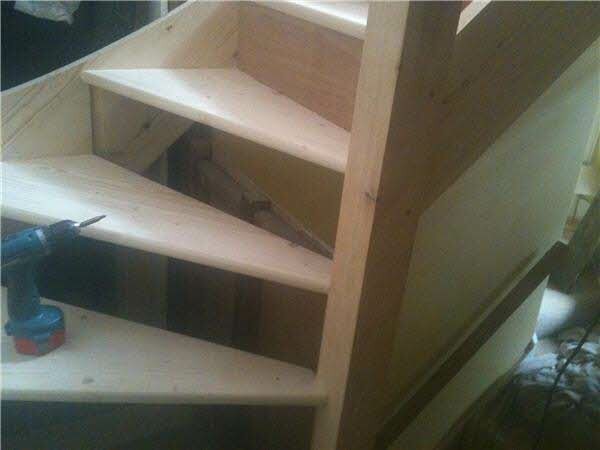 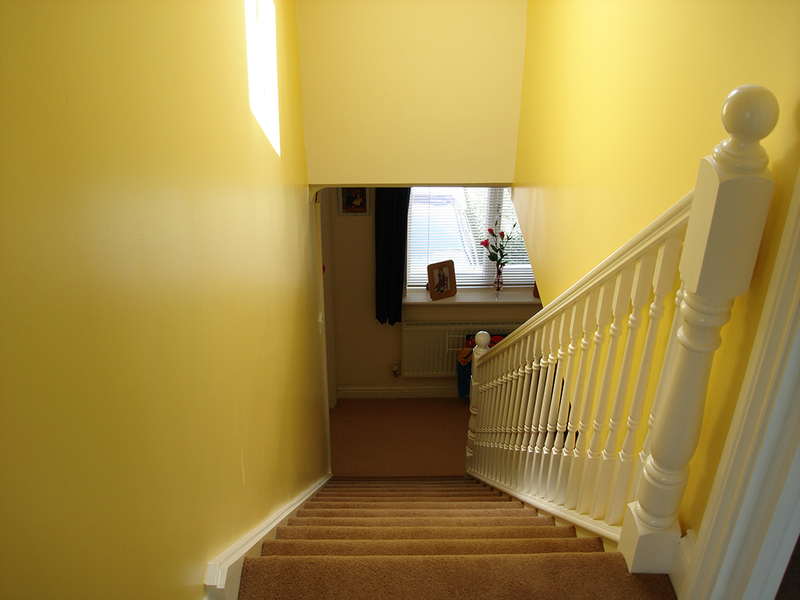 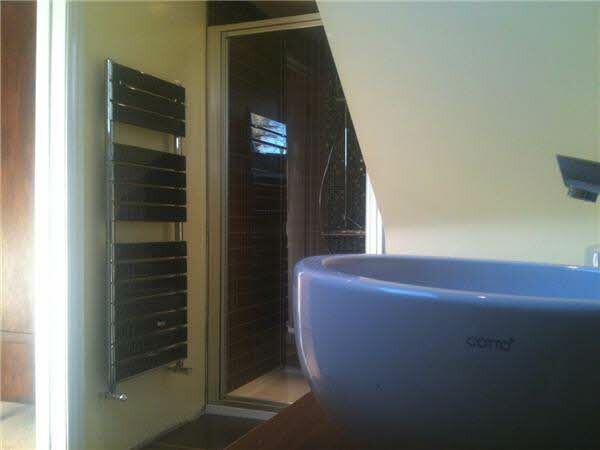 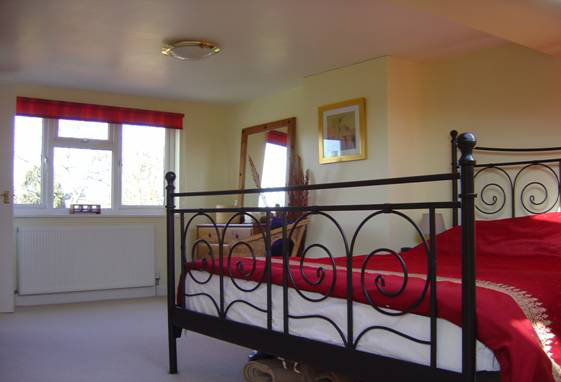 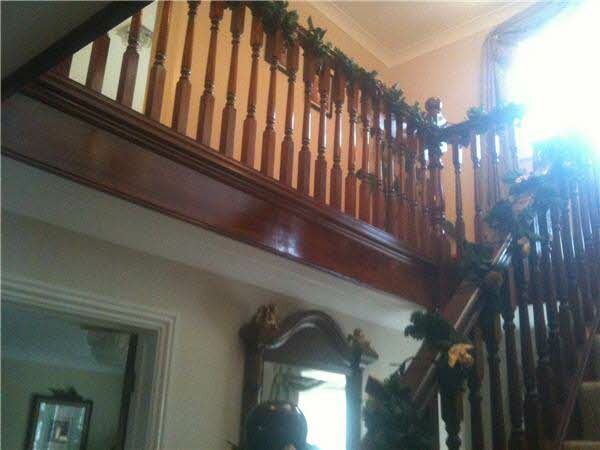 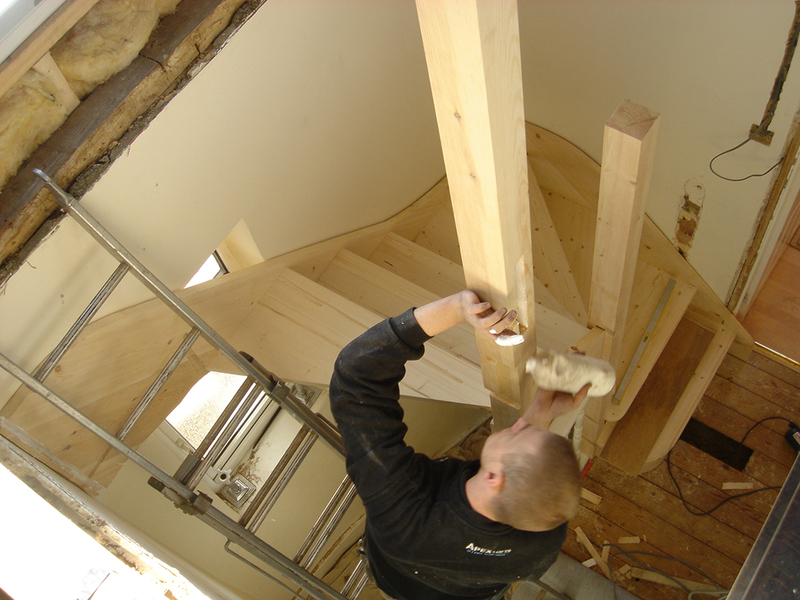 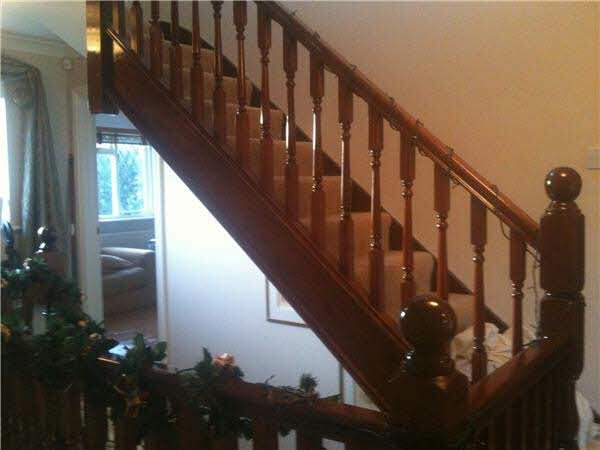 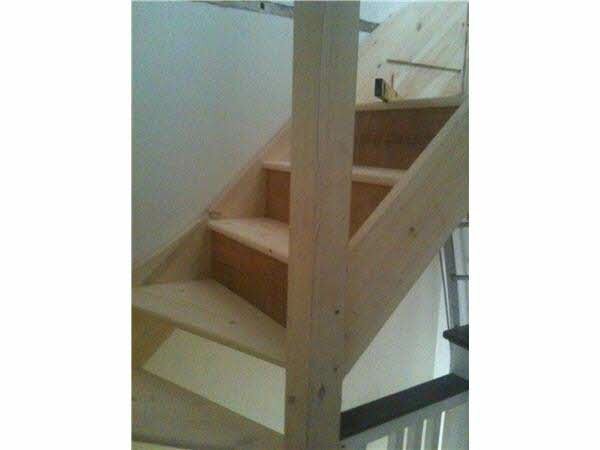 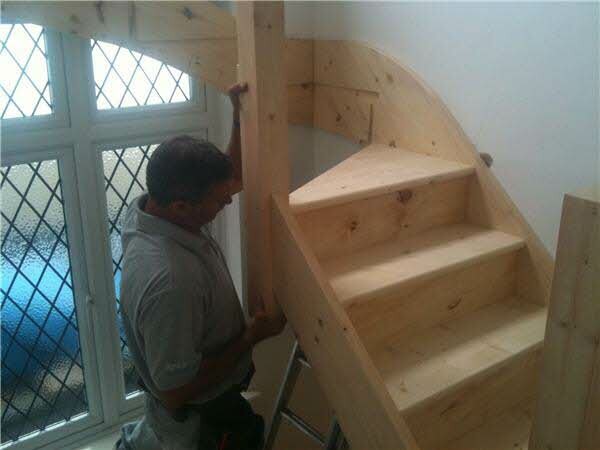 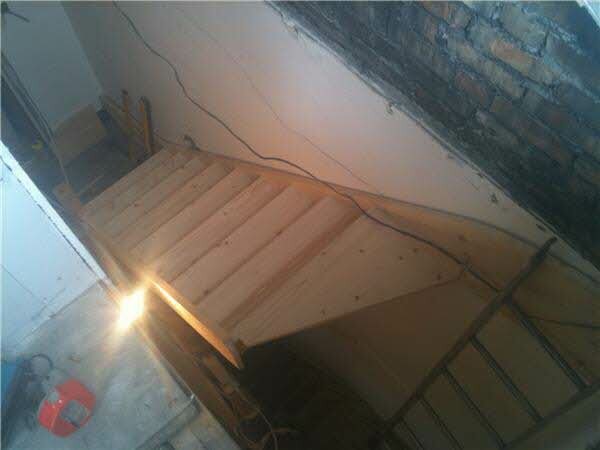 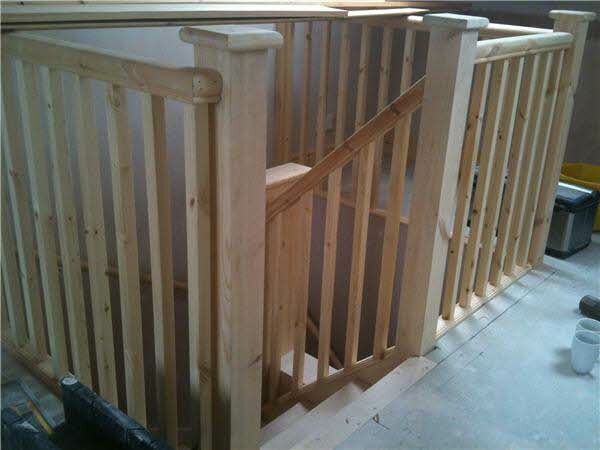 The staircase was then fitted, with turned newels and spindles, and the sanitary ware put into position.